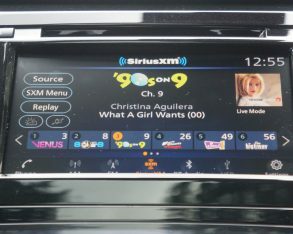 I don’t know what’s going on south of the 49th parallel these days. 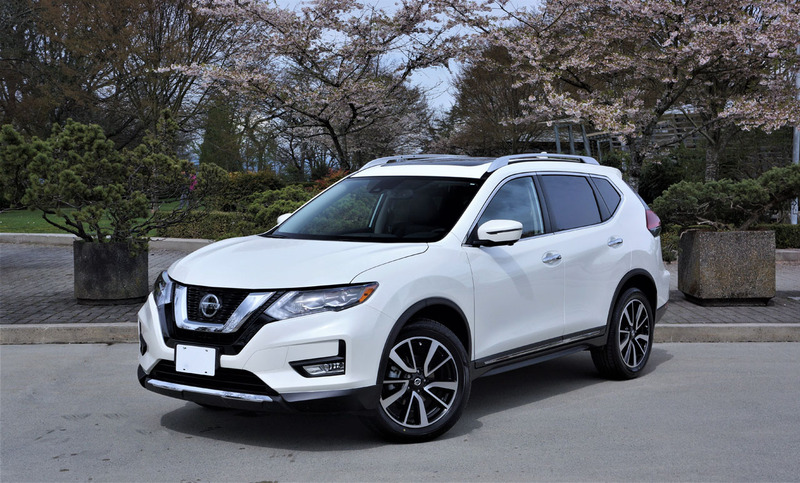 And no, I’m not talking the usual banter about trade, tariffs, walls, kids in incarceration, a stock market bubble, etcetera (notice I didn’t say Trump… oops), but rather how the Nissan Rogue managed to speed into the compact SUV segment’s top sales position. 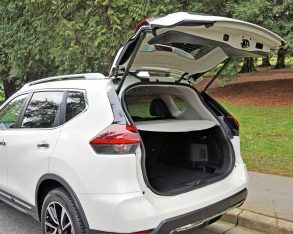 Tops in the U.S. means it’s also the best-selling compact SUV in North America, its U.S. and Canadian combined sales reaching 237,606 units over the first six months of 2018 compared to 224,996 for last year’s sales leading Toyota RAV4. 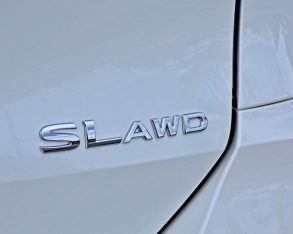 While many factors can play into market success, another week with a Rogue SL Platinum AWD reminded me of a number of very likely reasons it’s doing so well. 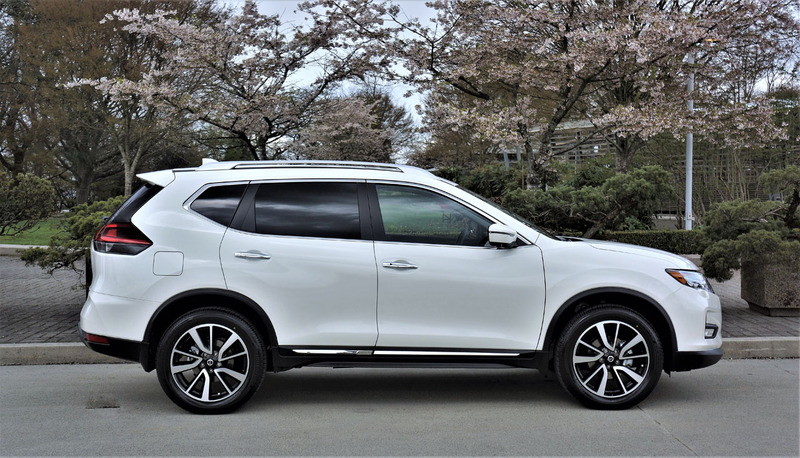 First of all, the Rogue remains a great looking crossover SUV despite this second-gen model having been with us since 2013. 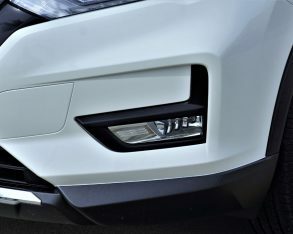 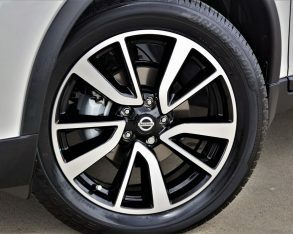 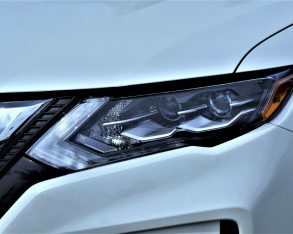 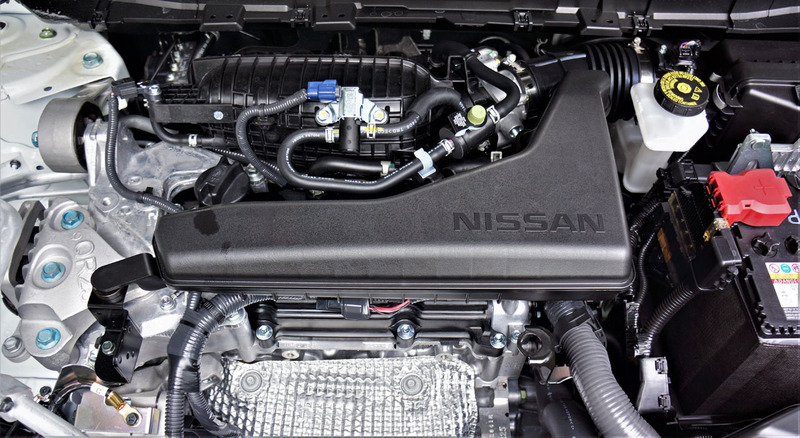 Of course, it had a stylish mid-cycle update just last year, which saw Nissan’s broader more “U” shaped “Vmotion 2.0” grille add a bit more masculine ruggedness to the otherwise sleek design, while its headlights received more sophisticated inner complexity thanks to quad beams and standard signature LED daytime running lamps. 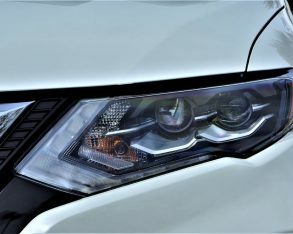 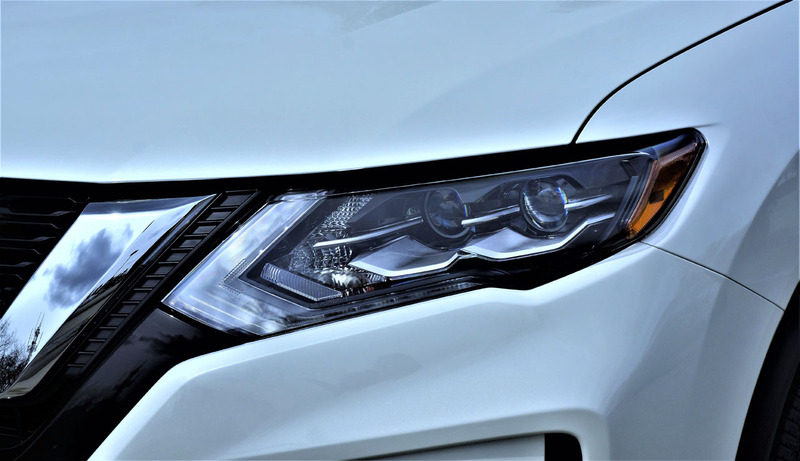 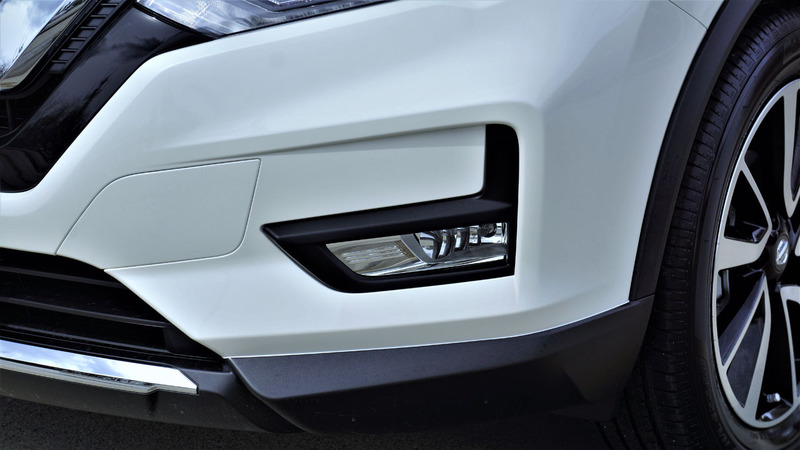 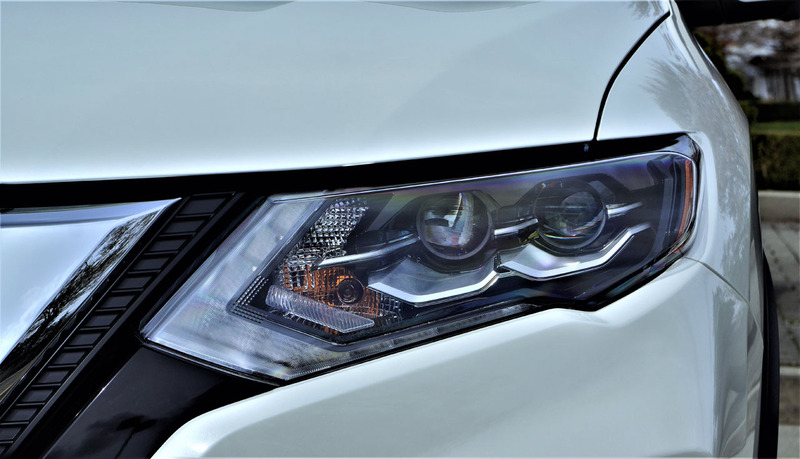 Additionally, full LEDs were made available to the previously tested and currently reviewed SL Platinum, while a reworked lower front fascia was included with all trims, receiving a narrow strip of LED fog lights with both SV and SL Platinum models. 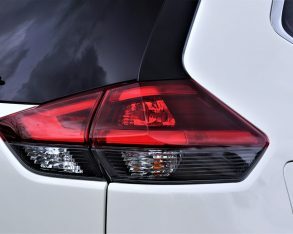 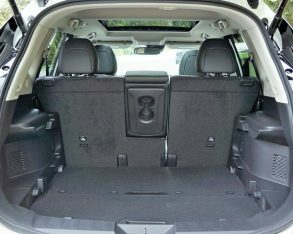 Less dramatic modifications were made down each side and at the rear, yet the result is a much more assertive looking compact SUV. 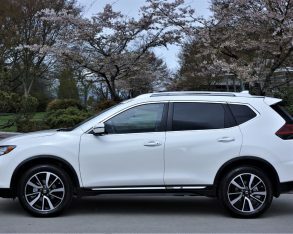 This said the 2017 update did more than just refresh Rogue styling, it also improved interior refinement, modernized some technologies, and made a bevy of advanced driver assistance features available. 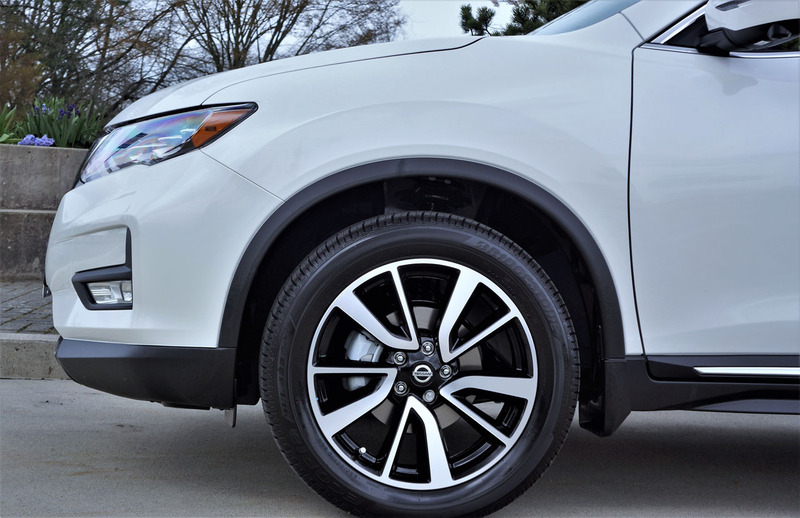 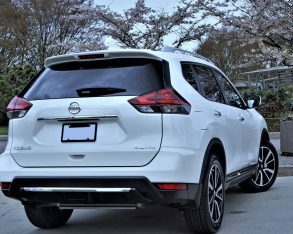 Safety has even been strengthened further for 2018, with Forward Collision Warning, Forward Emergency Braking, Blind Spot Warning and Rear Cross Traffic Alert now standard across the entire Rogue line, while you’ll still need to step up to SL Platinum trim to have Pedestrian Detection added to the Forward Emergency Braking system, plus Lane Departure Warning, Lane Departure Prevention, Moving Object Detection, automatic high beam headlights, and adaptive Intelligent Cruise Control with full speed range and hold. 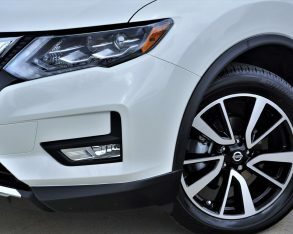 Last year this gear earned the Rogue a Top Safety Pick Plus rating from the IIHS when the SL Platinum trim’s standard LED headlamps with Smartbeam were factored in, but being that the U.S. government organization keeps moving the goalposts further away in order to raise safety standards it now only garners Top Safety Pick status. 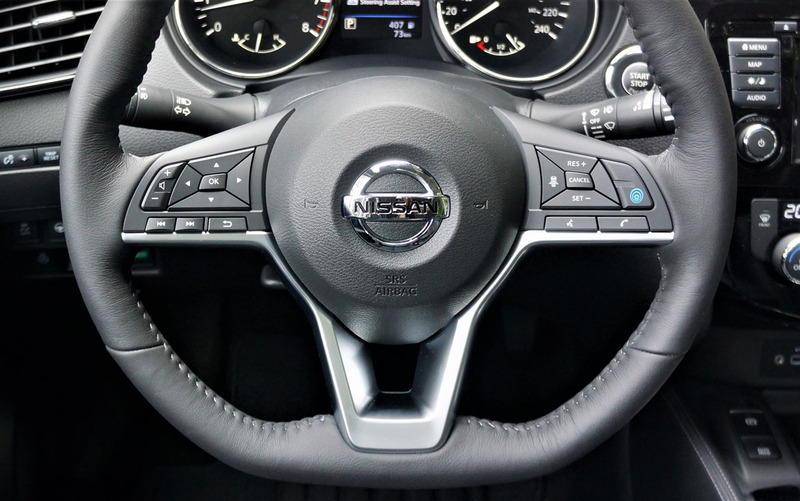 Even bigger news this year is the addition of Nissan’s ProPilot Assist semi-autonomous “hands-on-wheel” driving system to SL Platinum trim. 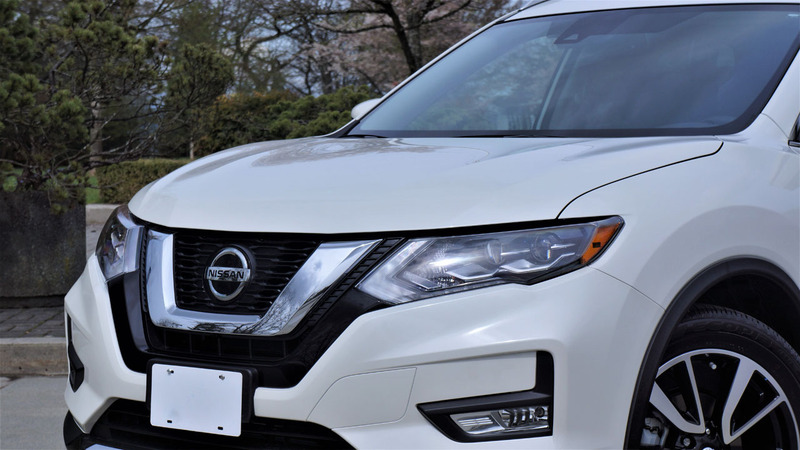 The top-tier model is actually called SL Platinum ProPilot Assist on Nissan Canada’s retail website, and it’s a good thing it’s not a pricey option as buyers might feel shortchanged once the initial wow factor wears off. 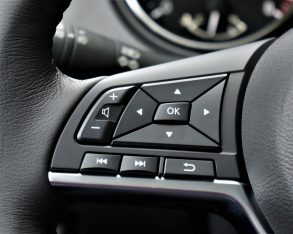 Yes it will certainly impress the uninitiated, thanks to its ability to almost completely take over driving functions on the highway, even coming to a full stop in bumper-to-bumper traffic or changing lanes after you signal a desire to do so, but imagine for a moment the need to place both hands back on the steering wheel every eight seconds in order to prevent a warning chime from sounding off and red dash light from flashing, which gets a lot more annoying if you don’t, and it soon becomes evident this future technology is not ready for prime time. 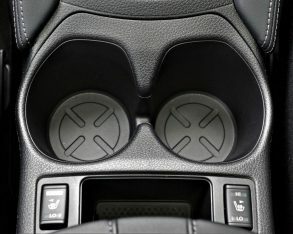 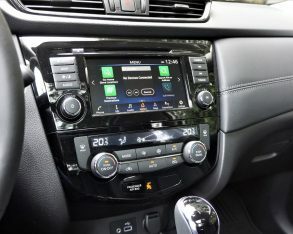 To be fair (and not rile the Nissan PR reps that are very clear about what ProPilot “Assist” can and cannot do), this is a hands-on system, not designed to work while your hands are on your lap, behind your head with the driver’s seatback reclined, and certainly not holding a smartphone, tablet or book. 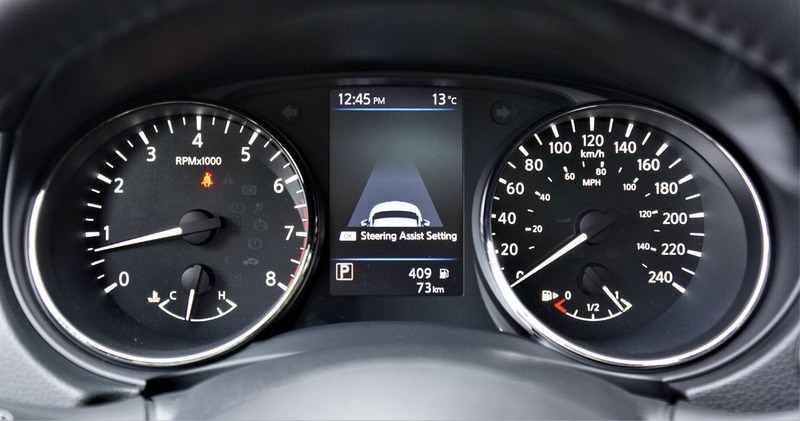 That’s the stuff of a fully autonomous driving future (or brave Tesla owners), the Nissan system alternatively providing steering assistance that some find helps to reduce fatigue over a long distance. 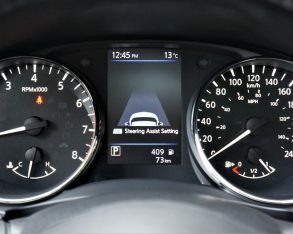 And don’t worry about falling asleep, as the constant beeping that occurs when veering too close to a lane marking will keep you fully awake and alert, and possibly annoyed. 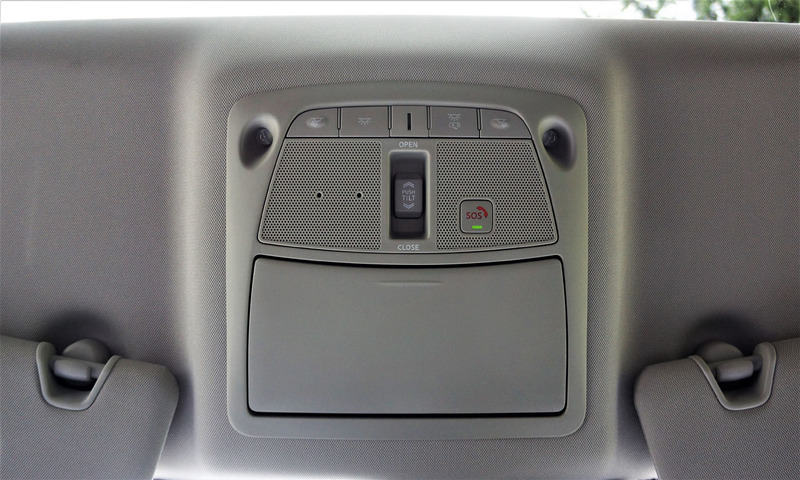 I’m not one for incessant beeping, sometimes causing me to turn off overly sensitive parking sensor systems, so therefore this ProPilot setup wouldn’t work for me, but I can appreciate why some drivers would like it. 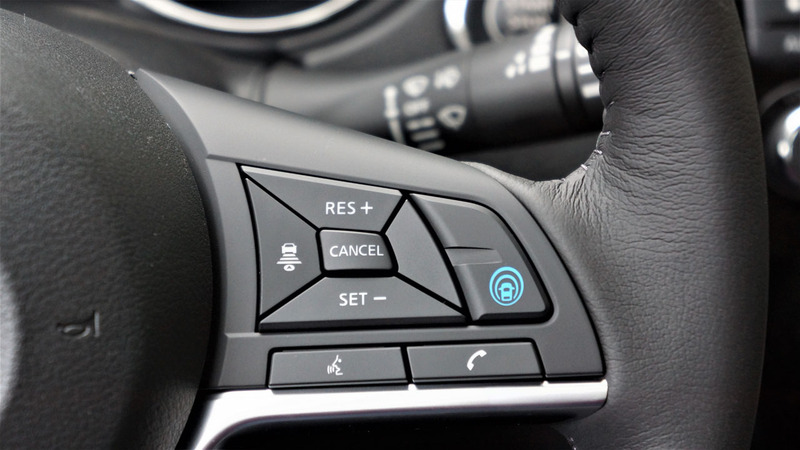 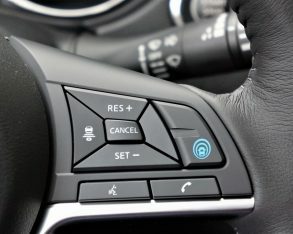 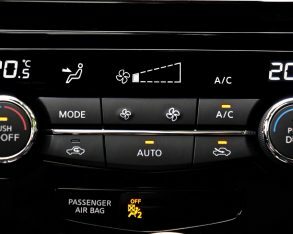 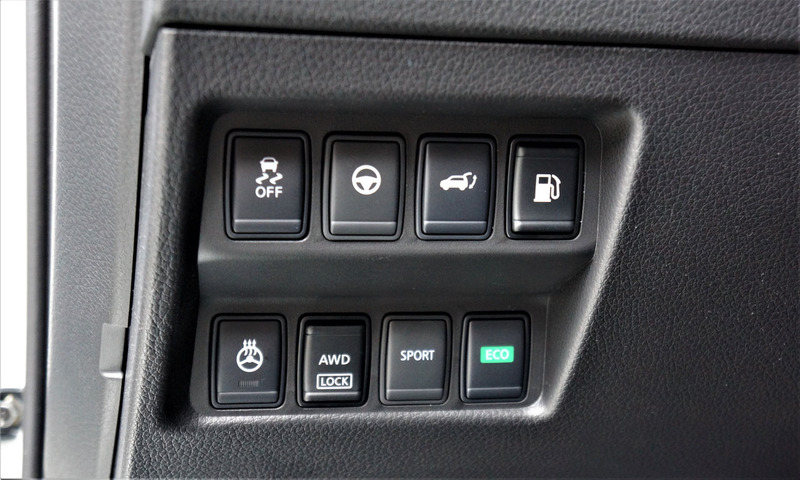 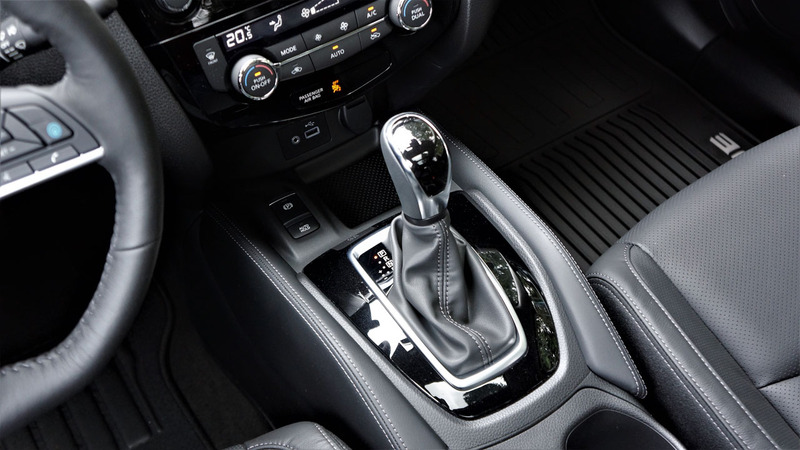 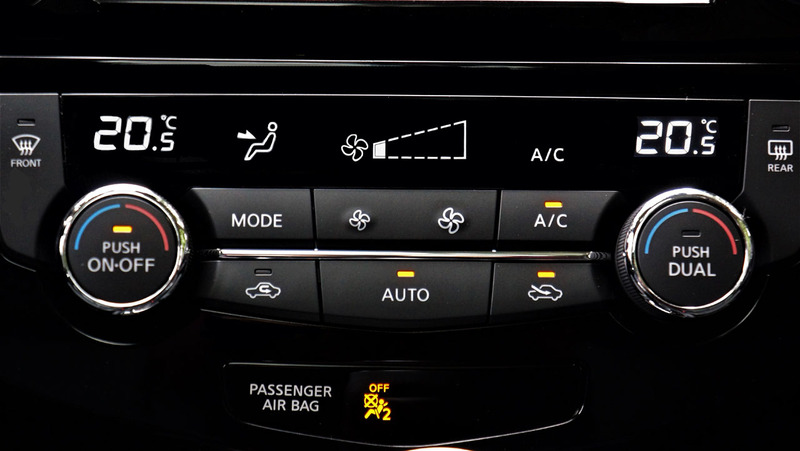 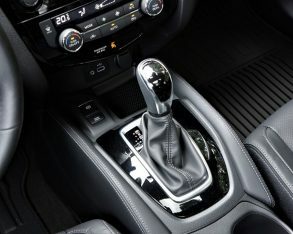 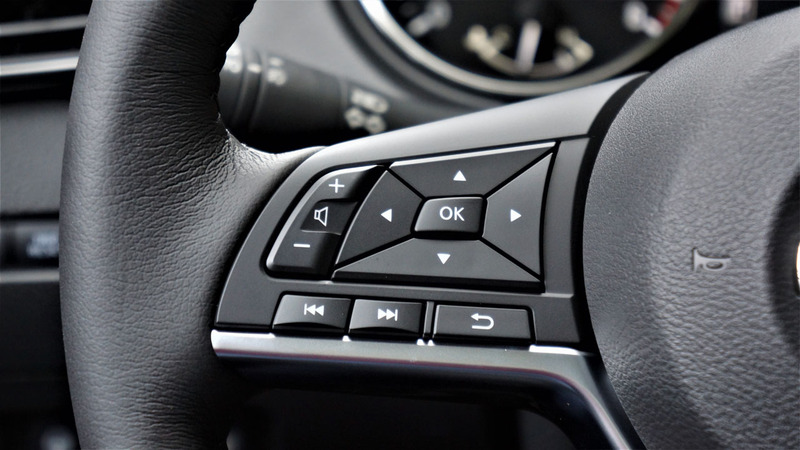 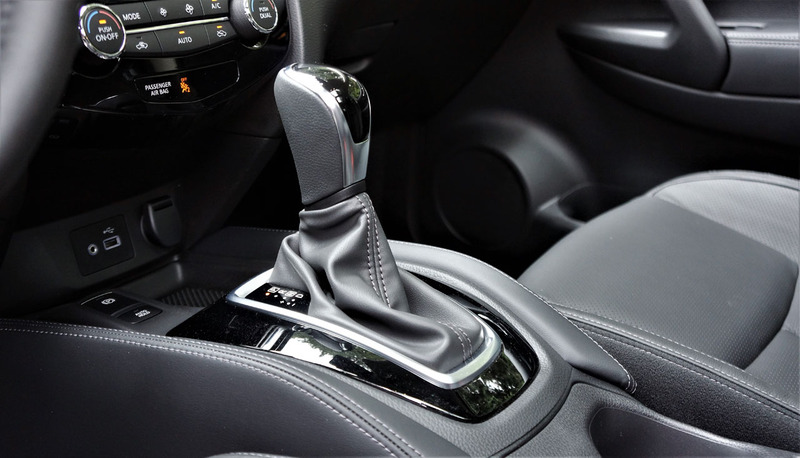 So go ahead and have some fun with it, because it’s really cool to watch the steering wheel turn on its own while your Rogue remains safely within its lane, and it only needs you to turn on the adaptive cruise control, set a given top speed, and press a blue button on the steering wheel to initiate. 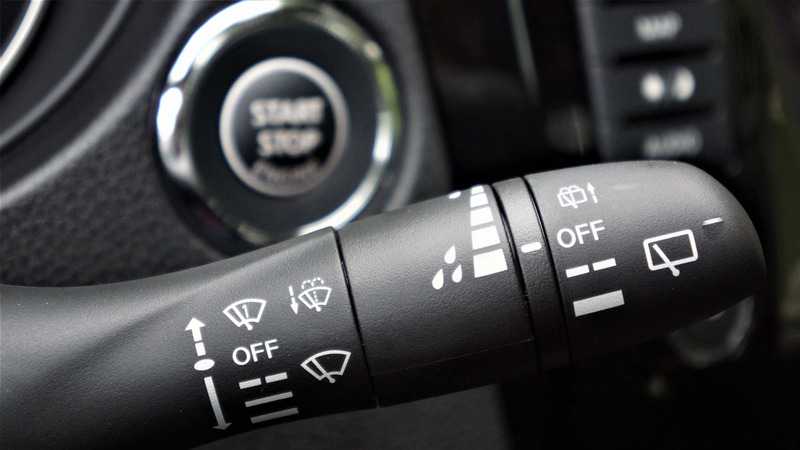 Also notable, ProPilot Assist will change lanes automatically just by flicking the turn signal. 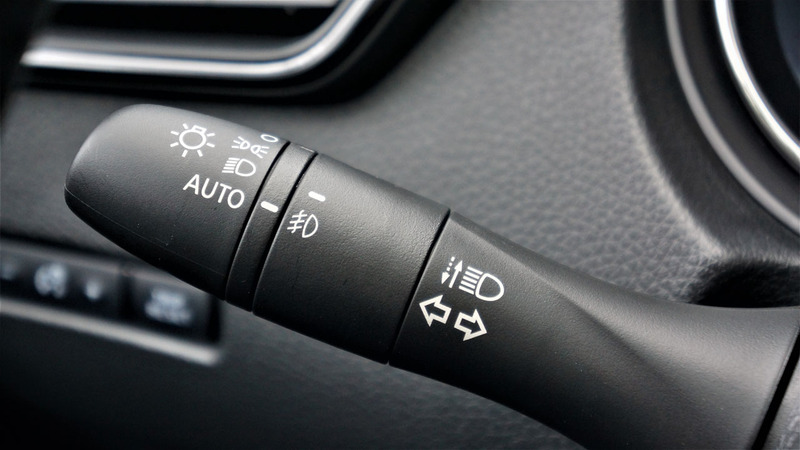 After analyzing the adjacent lane and finding a safe entry point it quickly moves to the right or left as per your signal indication. 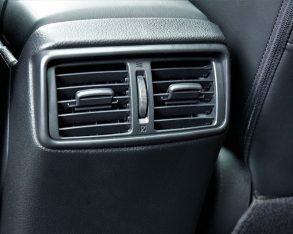 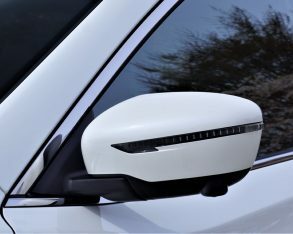 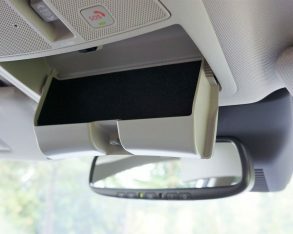 I could really see this feature assisting new drivers that are sometimes intimidated to change lanes at highway speeds. 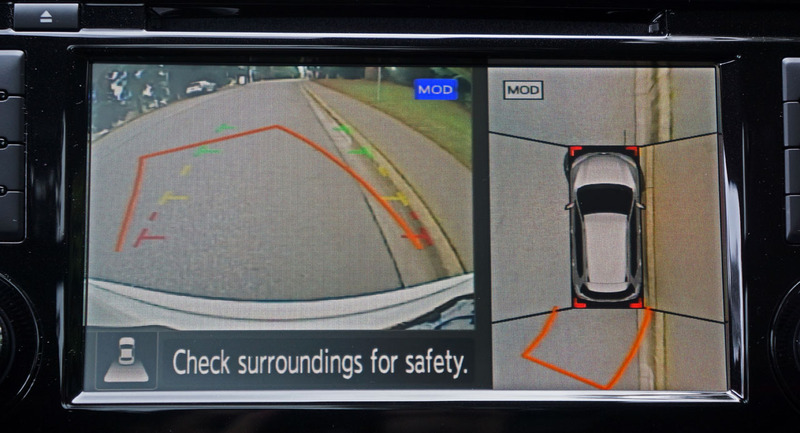 This said make sure to check your mirrors, as this technology is in its infancy and therefore can’t yet be relied upon 100 percent. 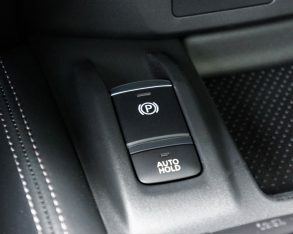 What’s more, don’t attempt to use its change lane feature to exit a highway, because once in the exit lane ProPilot Assist won’t slow down or turn to follow the off ramp. 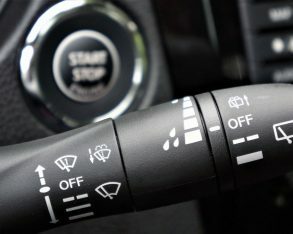 In fact, if I hadn’t taken over the controls it would’ve driven straight off the exit lane into the ditch. 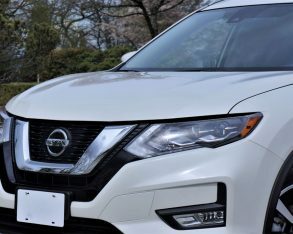 Granted, Nissan says only to use this system on a limited access highway, but being a curious journalist I just had to find out where that highway ends with respect to ProPilot Assist. 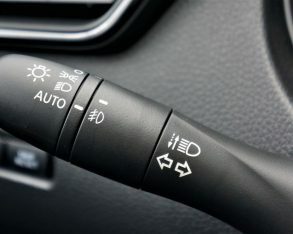 Now I know, it ends in the exit lane, or before, if you really want to be cautious. 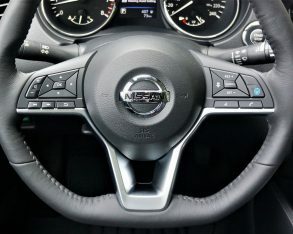 So kudos to Nissan for being the first mainstream volume brand to bring semi-autonomous “hands-on-wheel” driving to market. 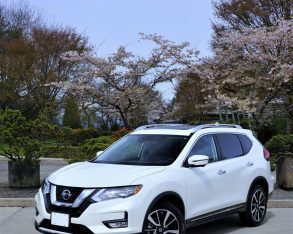 I’m sure it will improve with each new application, something Nissan has promised as it rolls out more autonomous capability in the future, including its ability to be used in city traffic. 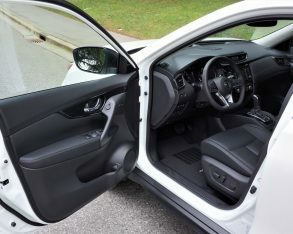 Additional standard SL Platinum features not yet mentioned include 225/55R19 all-season tires on 19-inch alloys, an electromechanical parking brake (lesser trims get a foot-operated one), memory for the side mirrors and front seats, an auto-dimming rearview mirror, a heated leather-wrapped multifunction sport steering wheel, a leather shift knob, leather upholstery, dual-zone auto climate control, an Around View parking monitor, navigation, SiriusXM Traffic, NissanConnect with mobile apps, a really good Bose audio system with nine speakers including two subs, Radio Data System (RDS) and speed-sensitive volume control, a powered panoramic glass sunroof, and a motion-activated powered liftgate, plus it’s the only trim in the line that comes standard with all-wheel drive. 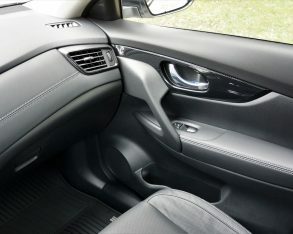 Take note the four-way powered front passenger’s seat has been deleted from SL Platinum trim for 2018, and I would’ve liked to see ventilated front seats and heatable rear seats added to the top-line features list, but nevertheless this top-line model still provides a significant load of high-end features for $37,098 plus freight and dealer fees, that number representing an $800 increase over last year’s non-ProPilot Assist equipped version, or so I found out at CarCostCanada.com, your best source for new vehicle pricing, dealer invoice pricing, and important rebate information. 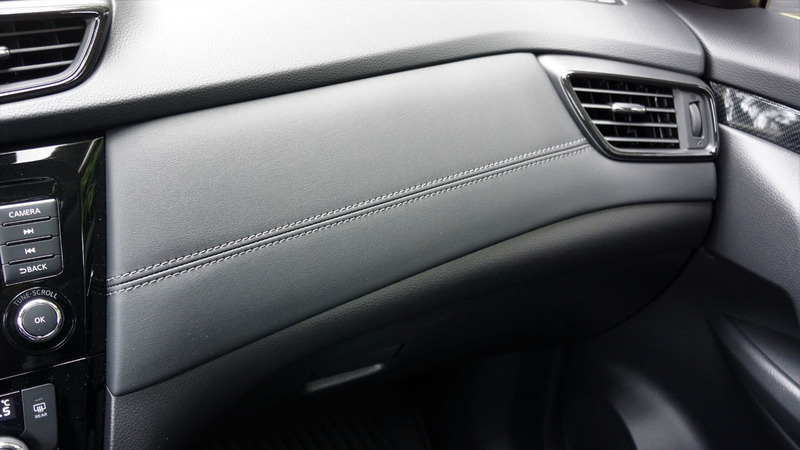 There’s just one factory upgrade available with the SL, but the Platinum Reserve Interior package appears worth the extra $500 if you like rich appearances. 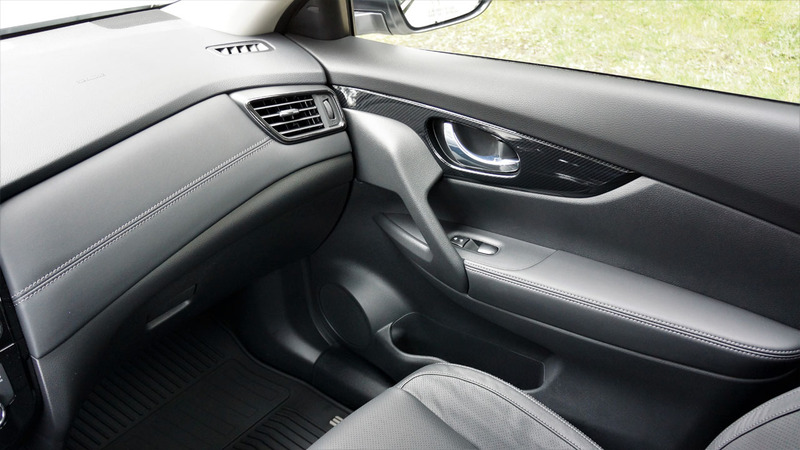 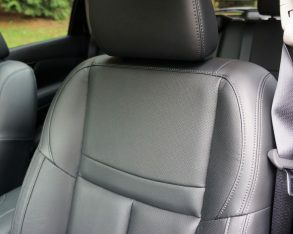 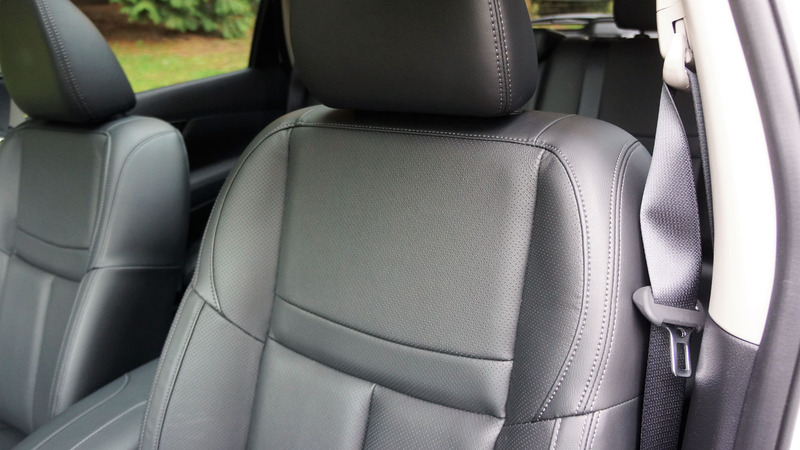 It adds unique Tan leather-appointed seats with special quilted leather inserts. 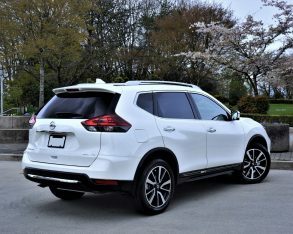 Alternatively, my tester’s Pearl White exterior paint makes no-cost Almond leather available, an interior treatment that would no doubt look good with Magnetic Black or Caspian Blue too if it were made available (it’s not, despite being offered south of the 49th along with a host of other exterior colours), although probably not with Gun Metallic grey. 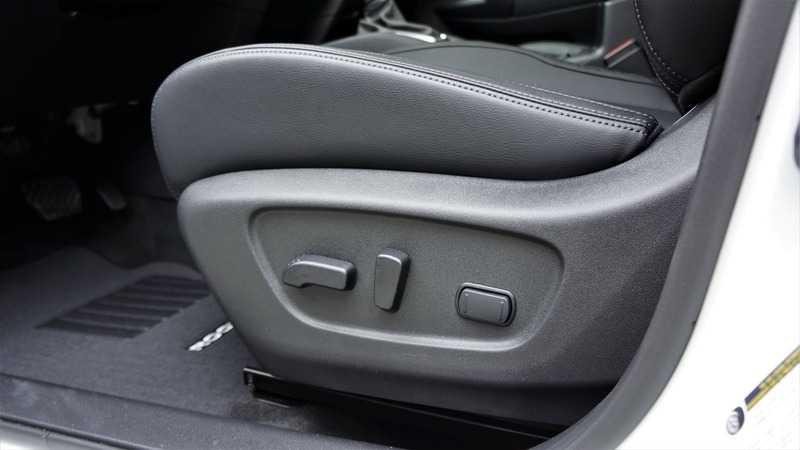 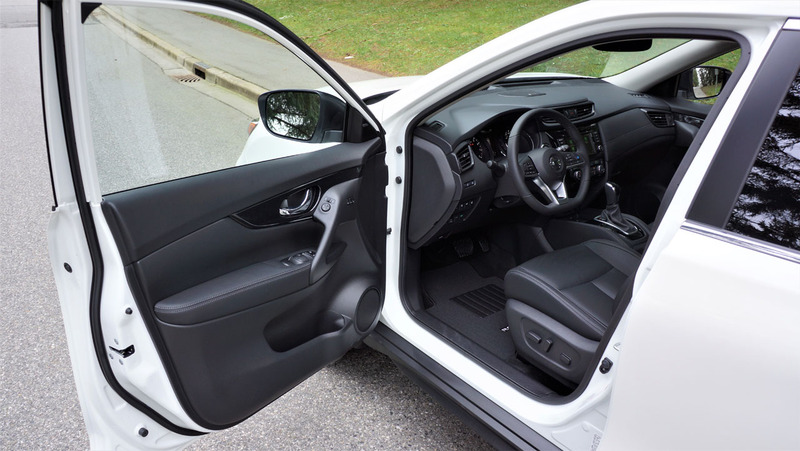 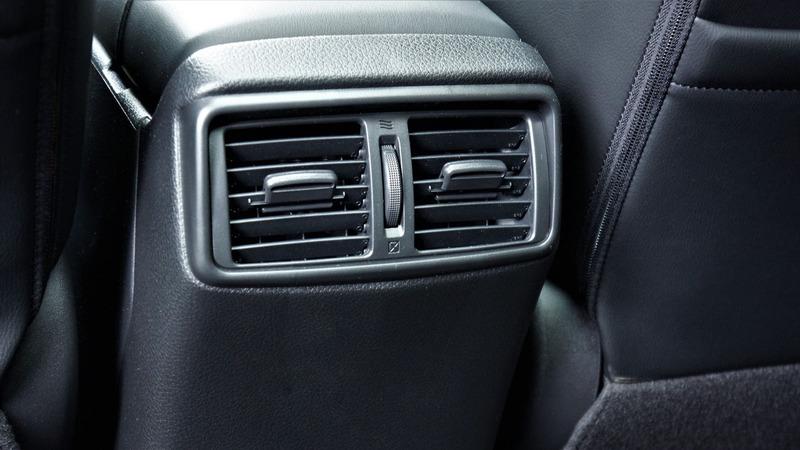 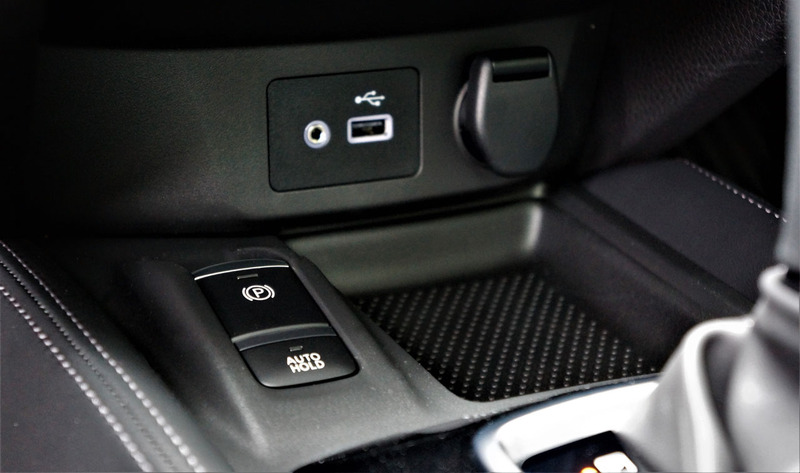 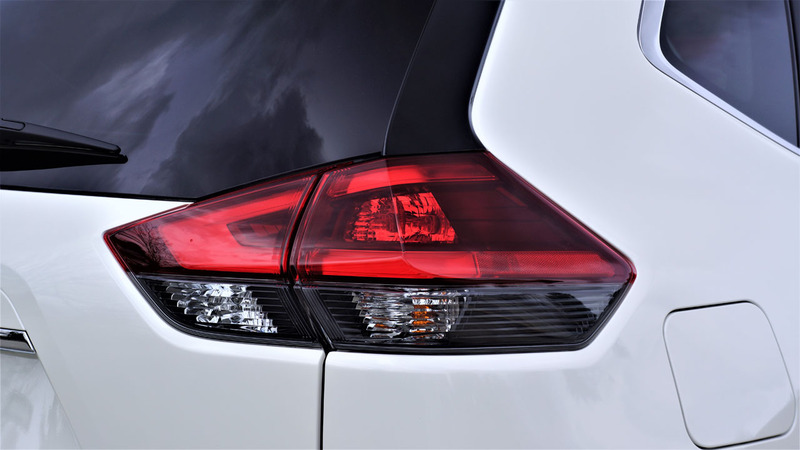 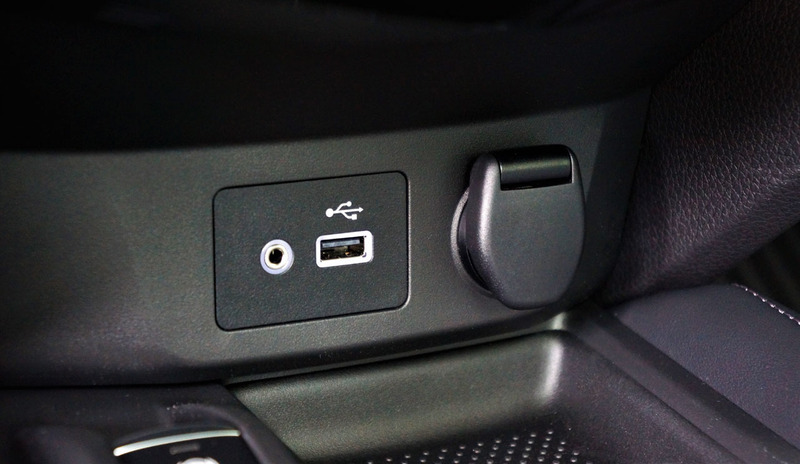 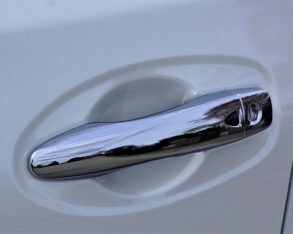 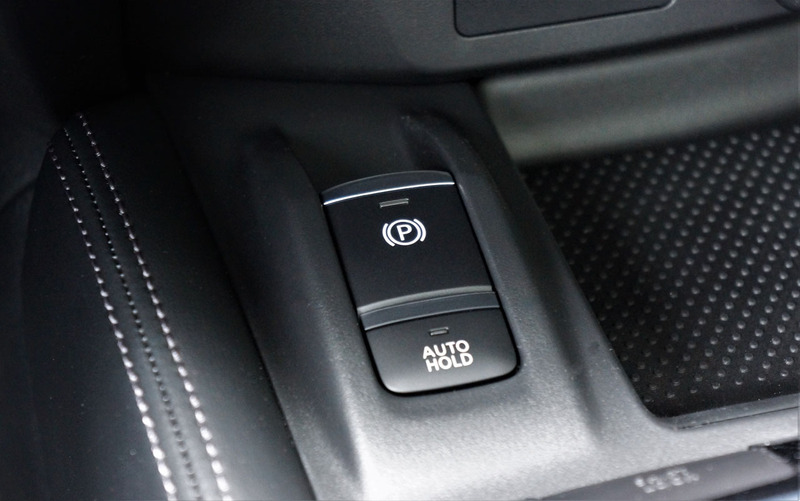 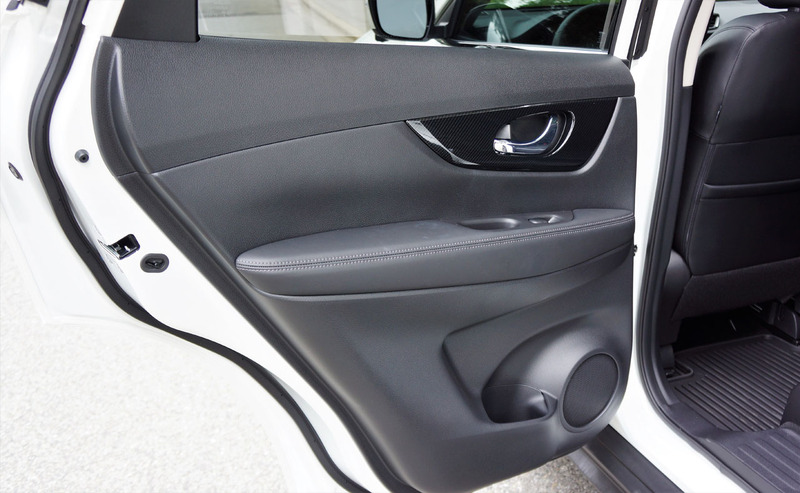 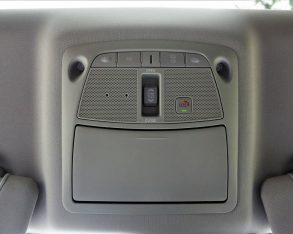 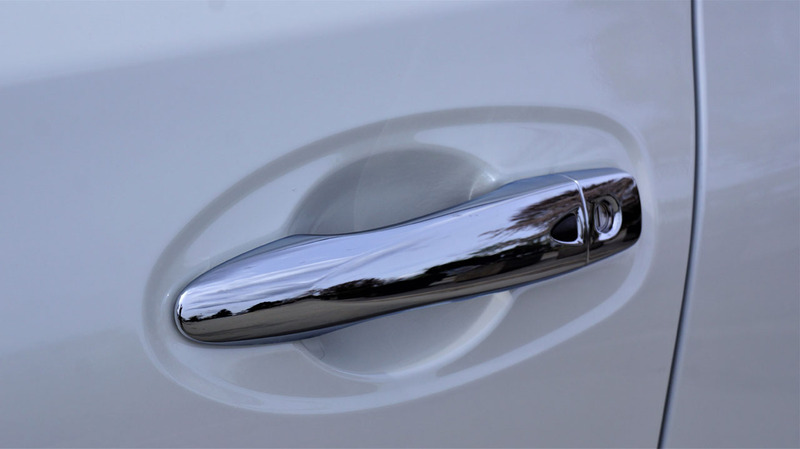 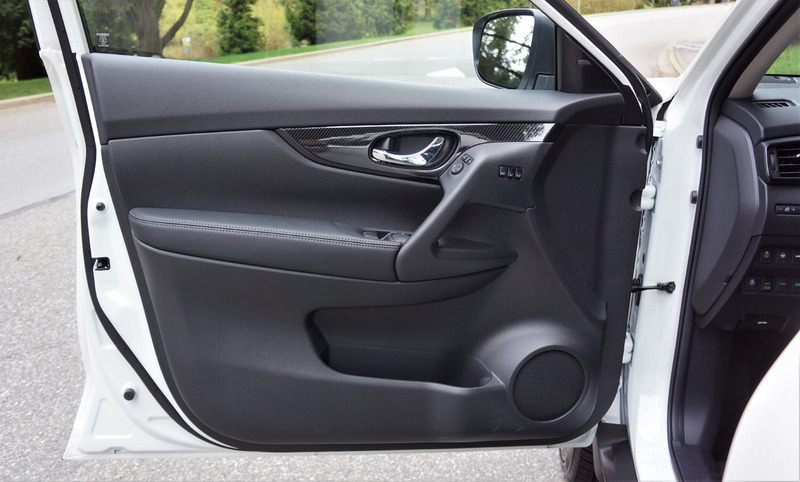 Just so you know, you’ll only need to have the proximity-sensing key fob in your pocket or purse to access either front door or rear liftgate, which is also power operated. 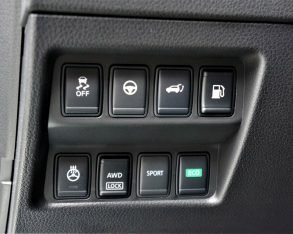 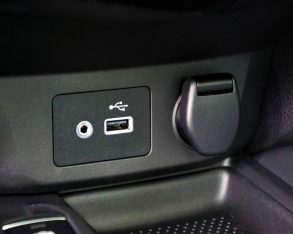 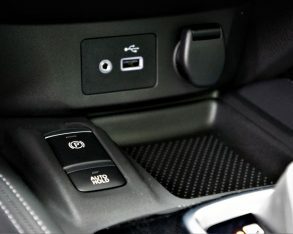 Nissan’s Intelligent Key comes with pushbutton ignition in $28,598 SV trim, with other features from this mid-range model including fog lamps, LED turn signals on the side mirror housings, roof rails, rear privacy glass, remote engine start, an eight-way power driver’s seat including two-way powered lumbar, a retractable cargo cover, and more. 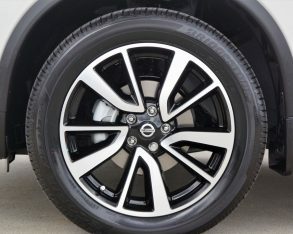 Notably, you can also choose a special blacked-out Midnight Edition, a nice upgrade for those wanting a sportier looking Rogue. 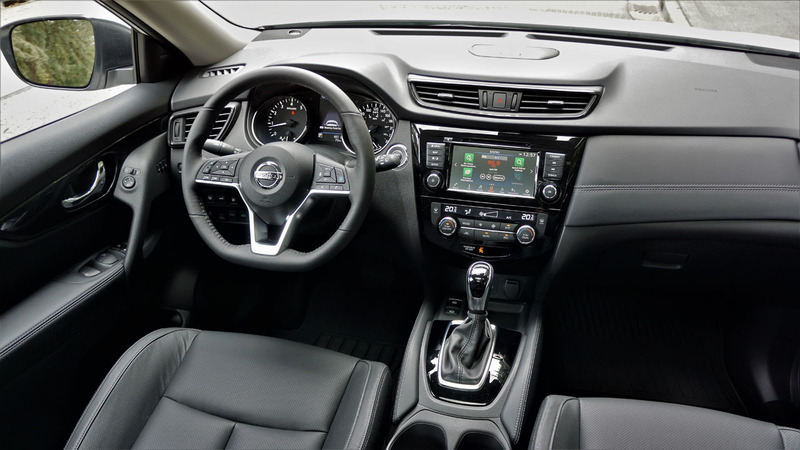 While based on the SV, it also includes that trim’s otherwise $2,600 Technology package, which adds the dual-zone auto HVAC, Around View monitor, navigation, leather, powered liftgate, Moving Object Detection, and more from other trims, all for $34,198. 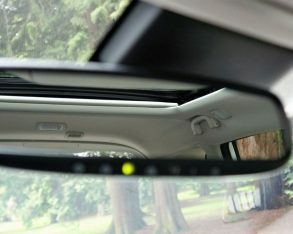 Features pulled up to my top-line SL Platinum model from $26,298 base S trim include auto on/off headlights, LED daytime running lights, LED taillights, heated power-adjustable side mirrors, tilt and telescopic steering, variable intermittent wipers, illuminated vanity mirrors, LED map lights, mood lighting, overhead sunglasses storage, micro-filtered air conditioning, Bluetooth phone connectivity with audio streaming, hands-free text messaging, a backup camera with dynamic guidelines, an AM/FM/CD/MP3/WMA audio system with satellite radio, USB and aux ports, Quick Comfort heated front seats (they heat up really fast), four cargo tie-down hooks, a rear seat pass-through, all the usual active and passive safety features, and much more. 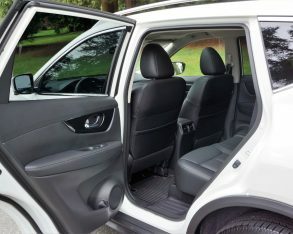 Once inside I’m sure you’ll appreciate the care and attention Nissan has given to the cabin. 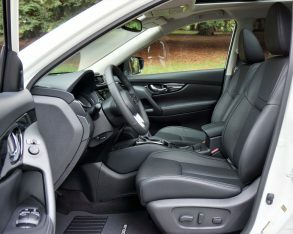 It actually comes close to matching some premium brands, and while it’s missing upper crust compact luxury segment accoutrements like fabric-wrapped roof pillars, fully configurable digital gauges, and soft-touch rear door uppers, the entire dash-top and front door uppers are made from a nice soft padded synthetic. 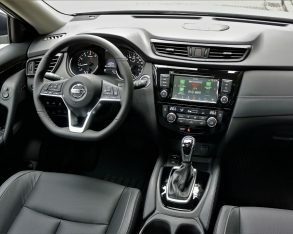 What’s more, Nissan also finished the instrument panel ahead of the front passenger with padded and French-stitched leatherette, while the driver gets a leather-wrapped flat-bottom sport steering wheel with aluminized spokes, plus a leather metal and glossy black shift knob, a leatherette shift boot, and plenty of piano black lacquered surfacing around that shifter and across the centre stack. 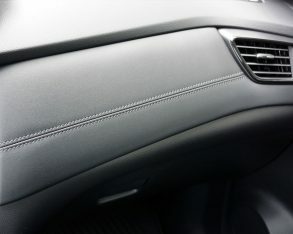 The door panel trim looks more like carbon fibre, but it matches nicely and dresses up the look well, while the armrests at each side and at centre feature stitched padded leatherette to match the instrument panel bolster and the same treatment on each side of lower console, this last feature not only looking good, but also preventing chafing of the driver and front passenger’s inside knees. 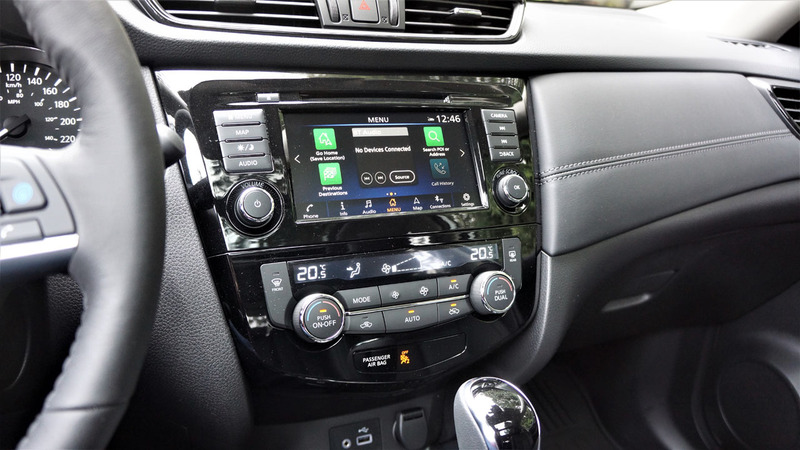 Over on the centre stack, a 7.0-inch touchscreen provides most everything someone buying into a premium-level compact SUV could want. 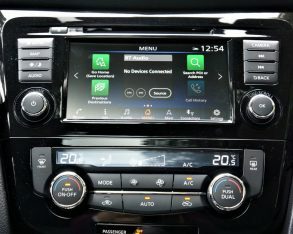 Its resolution is good, albeit not the clearest or crispest in the industry, and being a matte finish the depth of colour and contrast isn’t quite as rich, but fewer fingerprints will be a positive for many, while the infotainment interface is very good. 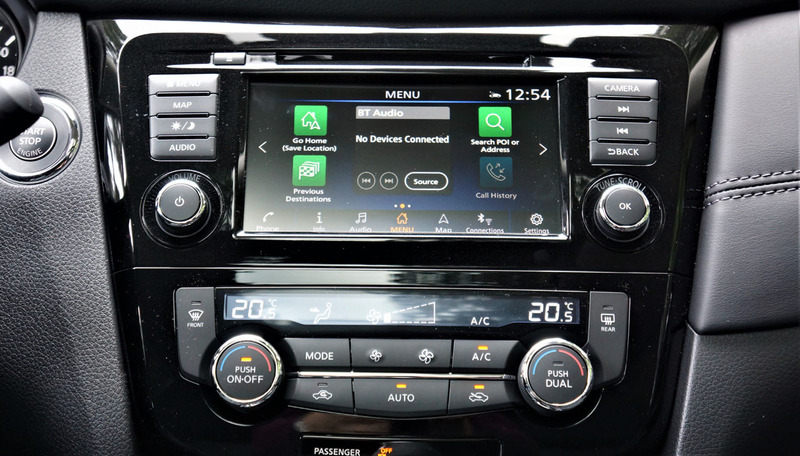 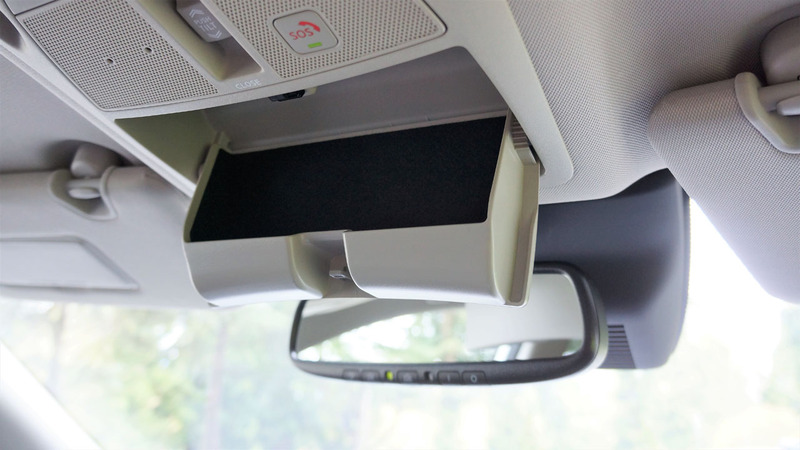 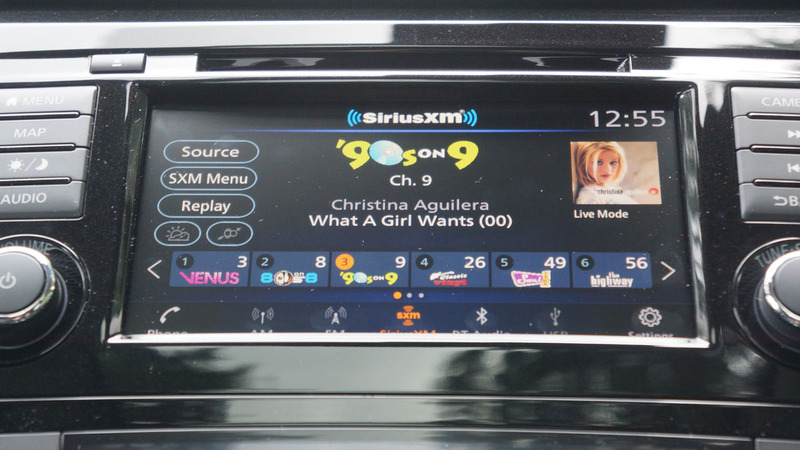 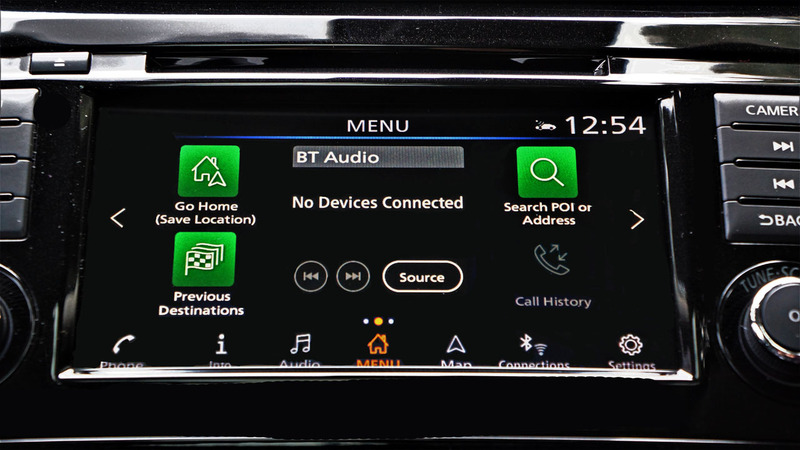 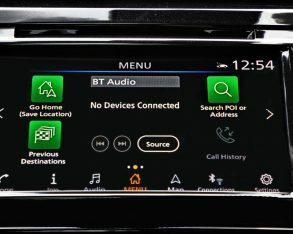 It includes easy connectivity for your smartphone and streaming audio, plus the audio section gets bright and colourful thanks to album graphics when using satellite radio, while Apple CarPlay and Android Auto are standard across the line. 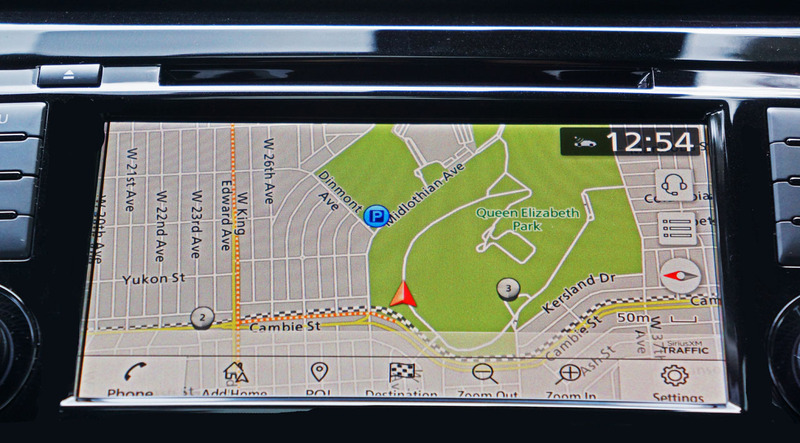 The navigation system is also impressive, with accurate directions via clear, detailed mapping. 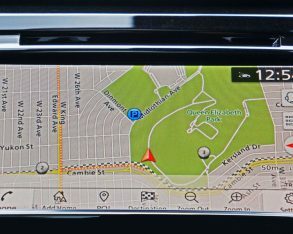 It even took us via the quickest route, and by so doing reminded me of alternative choices I hadn’t used for a long time. 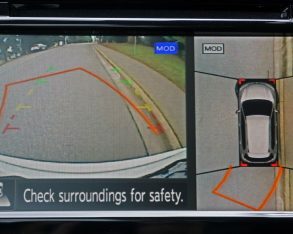 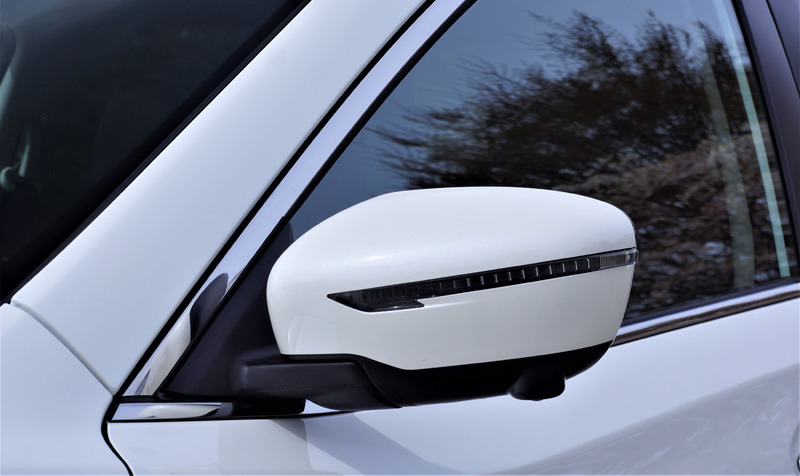 The upgraded parking camera was equally impressive, as it features a split screen that shows the usual rear view with active guidelines, as well as a top view with 360-degree surround visuals. 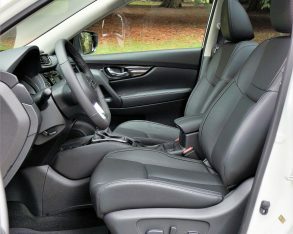 The driver’s seat controls provide plenty of adjustment, but I could have used a bit more reach from the telescopic steering column in order to set myself up for better comfort and control, a common problem due to having longer legs than torso. 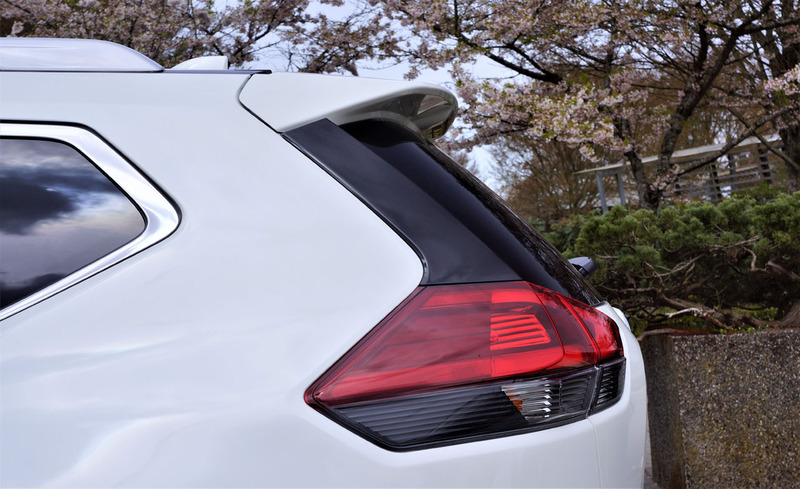 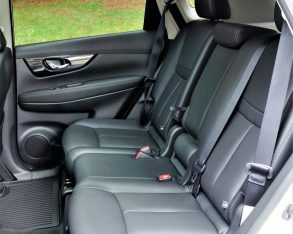 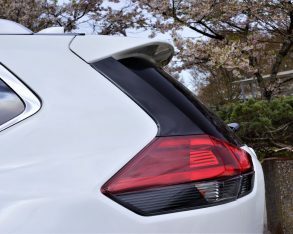 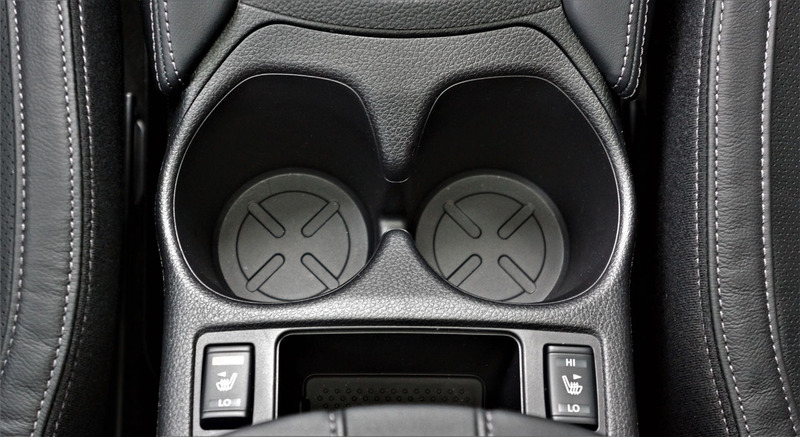 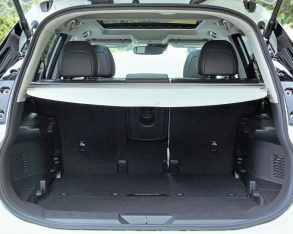 The seat itself is very supportive, cupping the small of the back nicely and providing ample side bolstering for this class of vehicle, while headroom and side-to-side spaciousness won’t likely be a problem for most body types. 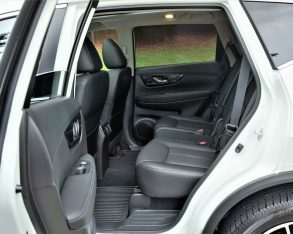 It certainly wasn’t for my regular sized five-foot-eight, medium-build frame, and with the driver’s seat positioned as ideally as possible I climbed into the back to check rear roominess, only to find that I still had loads of space to move around, with about eight inches ahead of my knees, plus plenty of space under the seats for the big boots I was wearing, allowing my legs to almost fully stretch out. 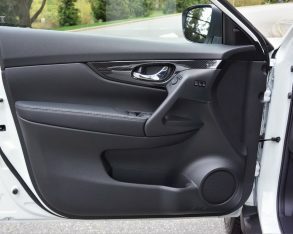 Likewise, there was about three and a half inches left over above my head and three next to my shoulder and the window, plus about the same from my hips to the door panel. 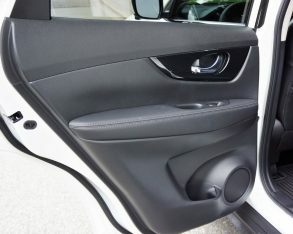 Other than the hard plastic door upper, that rear door panel is finished just as nicely as the one up front, while incandescent reading lamps for each outboard passenger, and large vents on the backside of the front console was about it for extras. 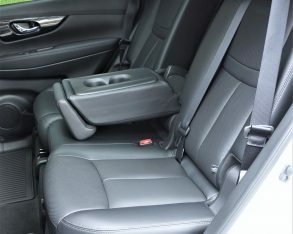 And no I’m not forgetting to mention the rear centre armrest because there isn’t one in the traditional sense, the Rogue instead giving rear passengers the option of folding down the centre pass-through that includes dual cupholders and enough room to each side for resting arms, but its hard plastic surfacing isn’t very comfortable. 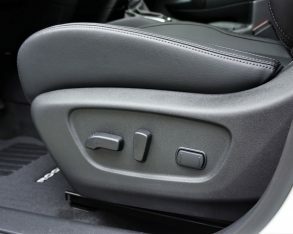 Most competitors that offer both an armrest and pass-through provide a separate door for the latter, but I’d take a pass-through over a rear armrest any day, so I can hardly complain. 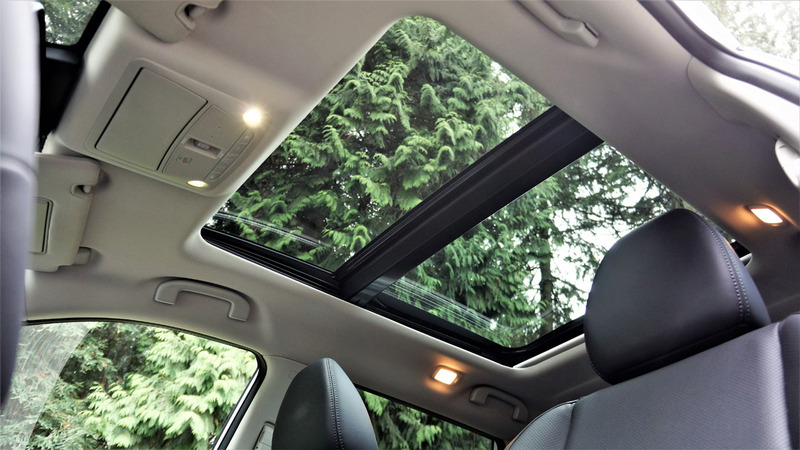 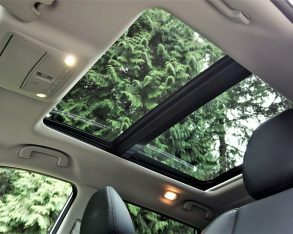 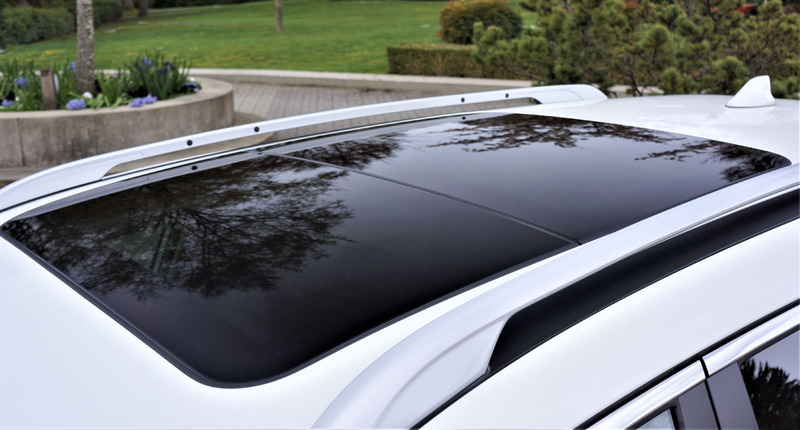 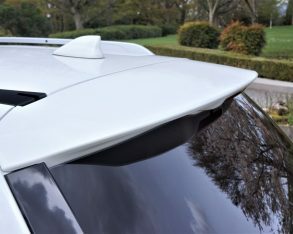 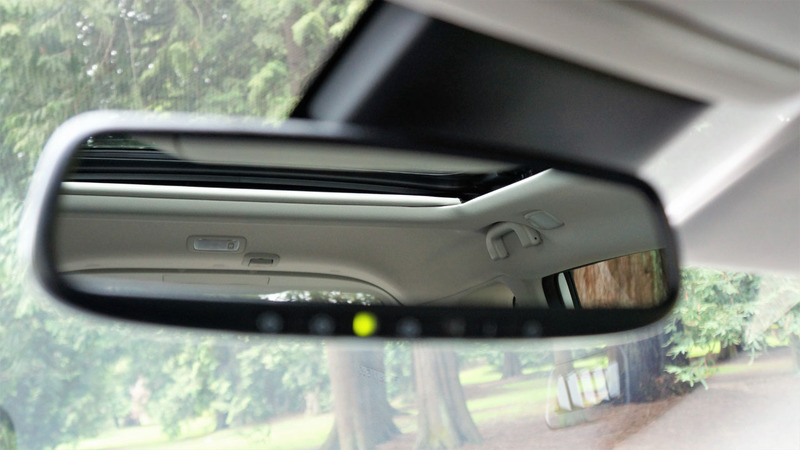 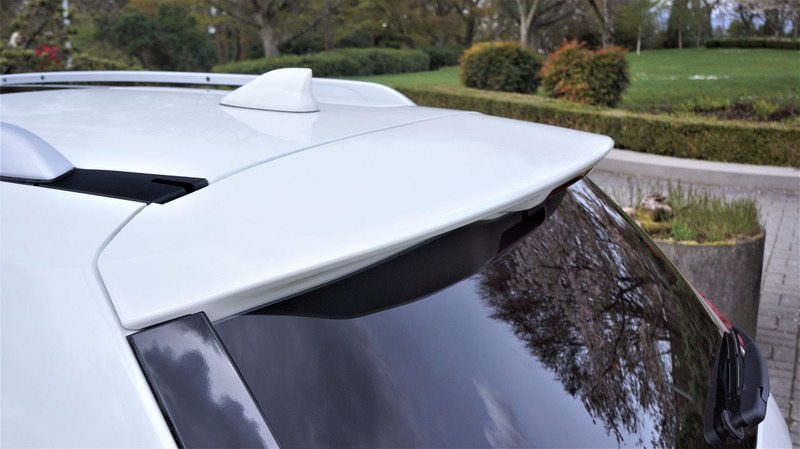 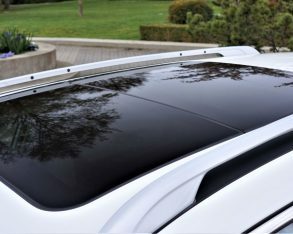 Another positive is the panoramic sunroof that really opens up the rear compartment from a visual perspective, while I should also point out that back seat visibility is excellent, as the side windows are tall and extend quite far toward the rear. 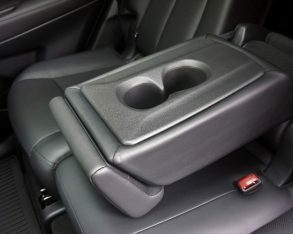 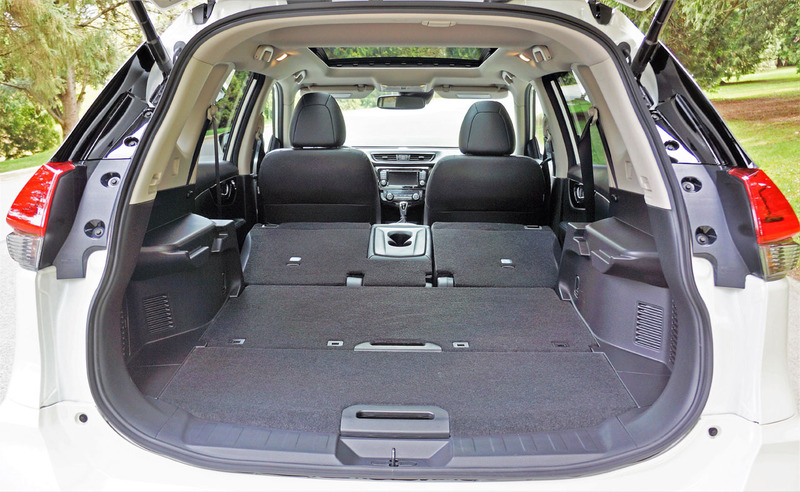 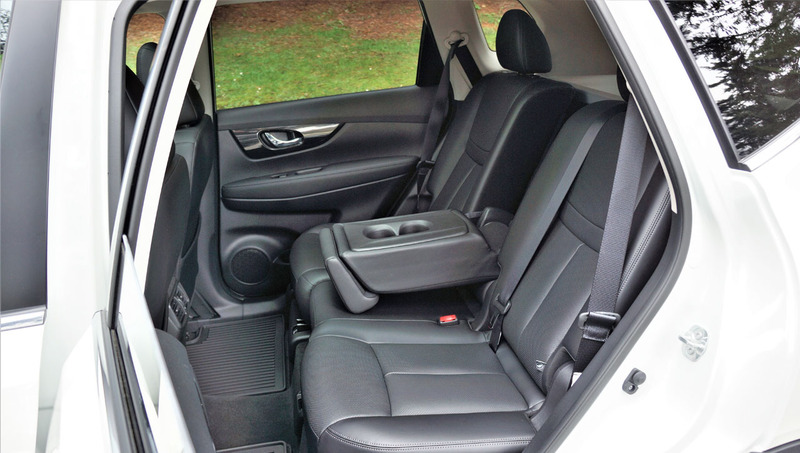 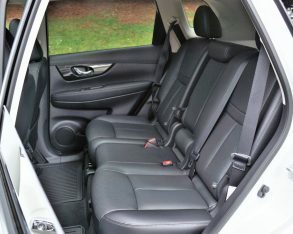 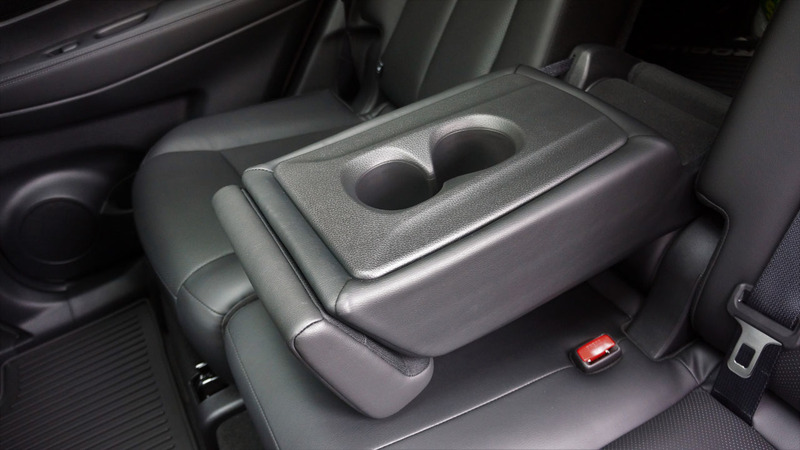 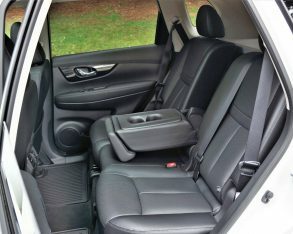 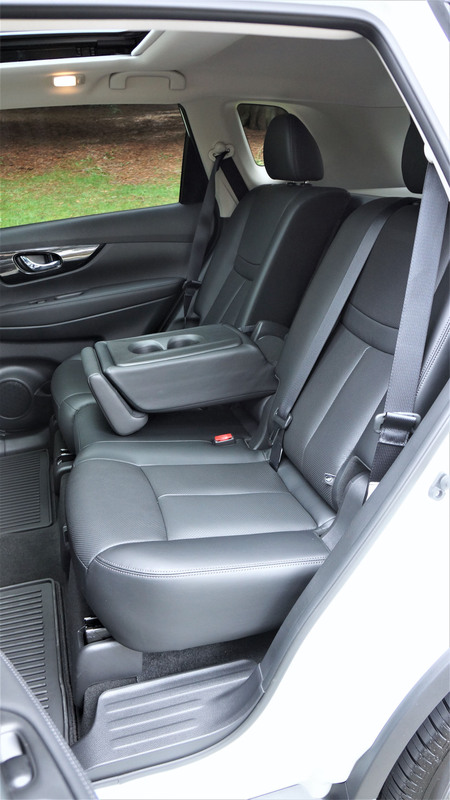 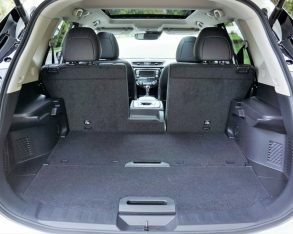 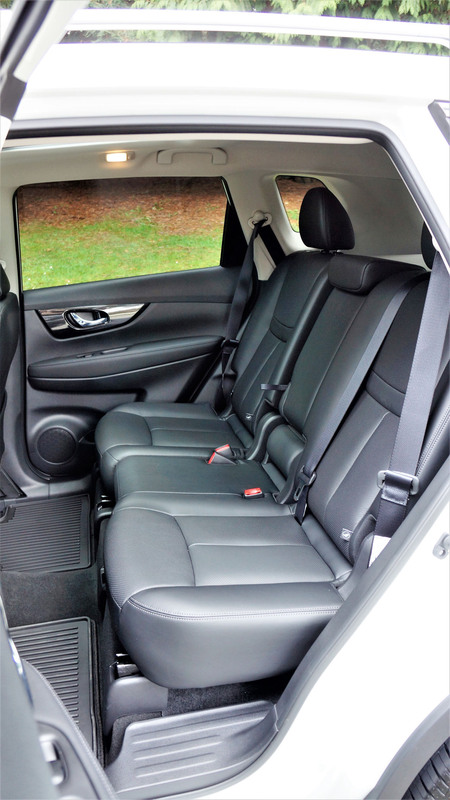 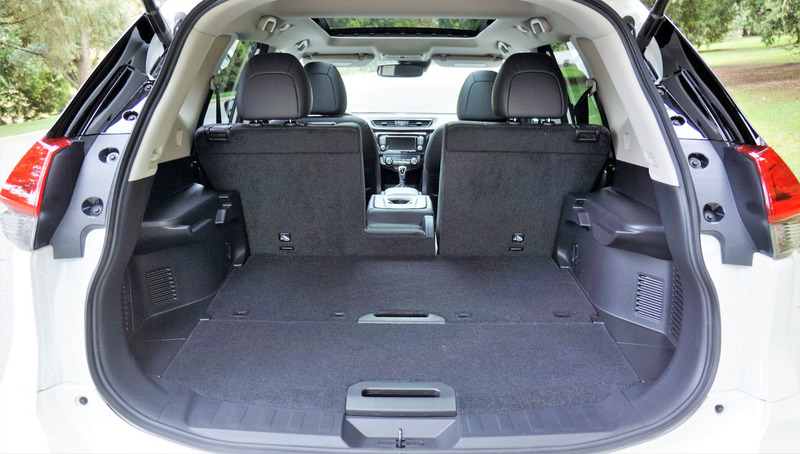 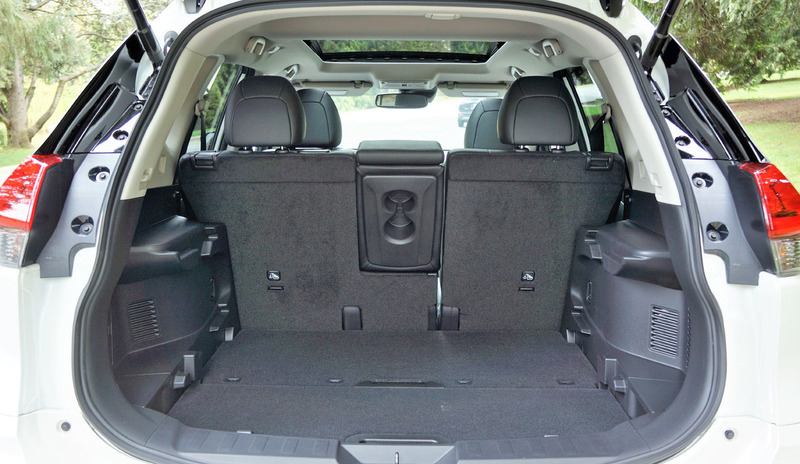 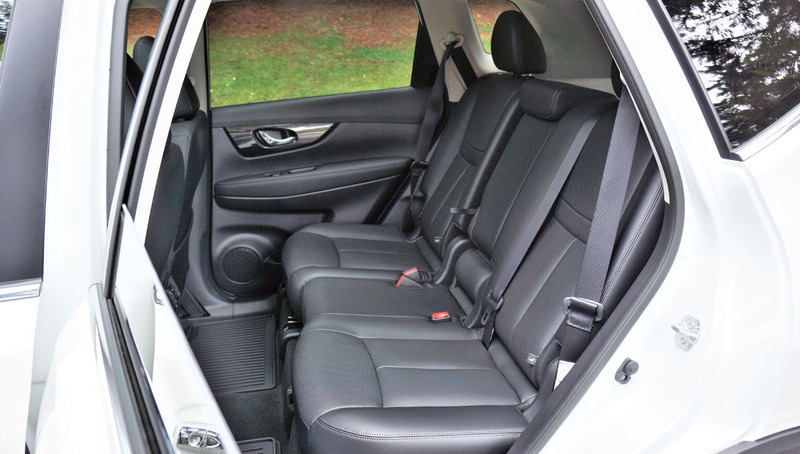 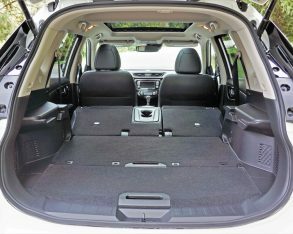 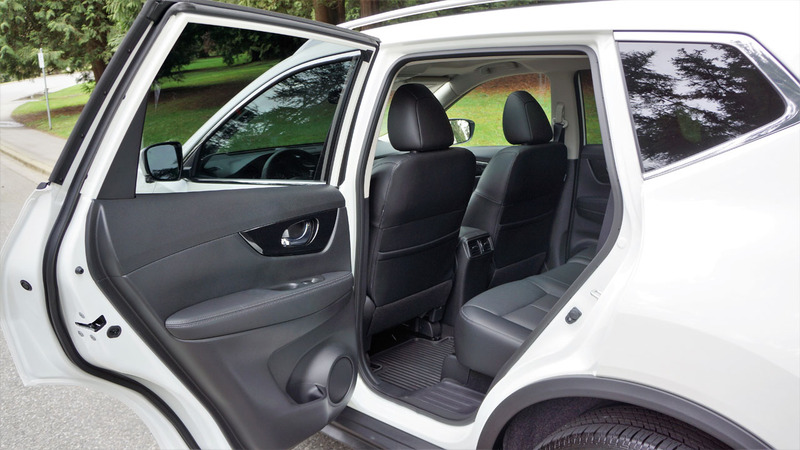 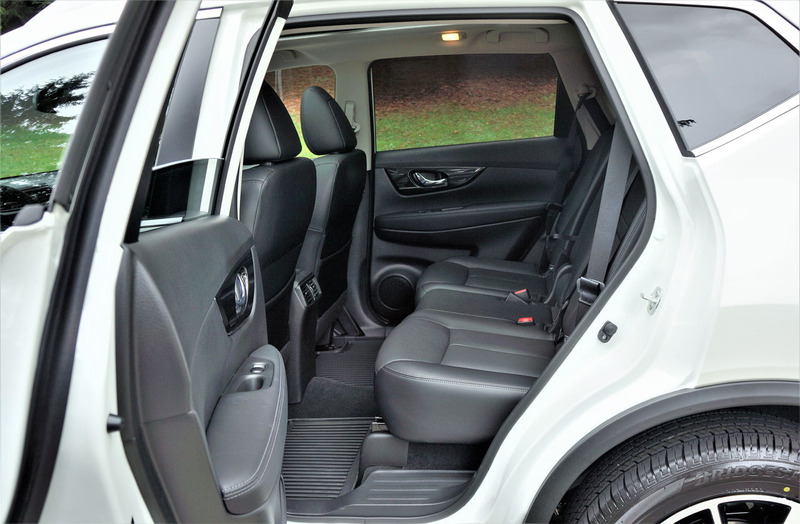 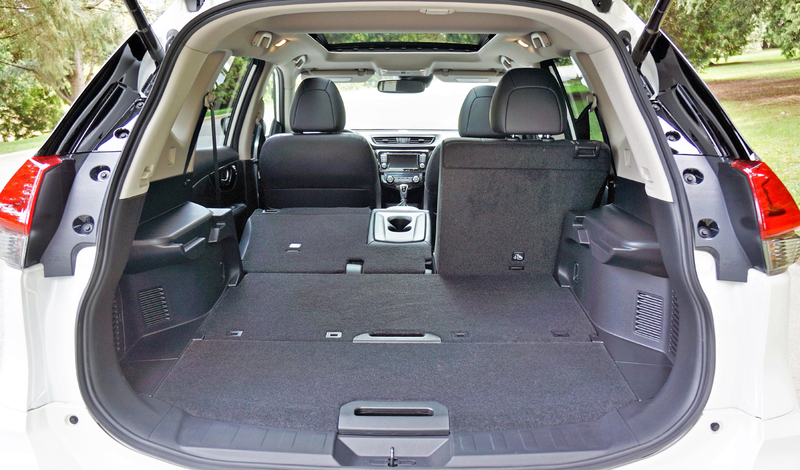 As accommodating as the Rogue is for passengers, it’s a cargo hauler’s dream thanks to 60/40 split seatbacks that open up the rear storage area from 1,112 litres (39.3 cubic feet) to 1,982 litres (70.0 cubic feet), making it one of the more capacious compact SUVs available. 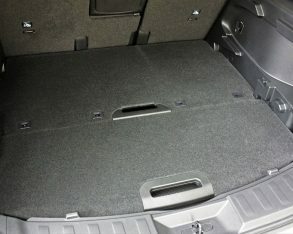 The rearmost portion is also quite flexible, its standard two-piece adjustable Divide-N-Hide shelving system starting off down on the floor, capable of being moved up in tandem to make a flat loading area when the seats are lowered, or alternatively set up higher for a shelf above a larger load below. 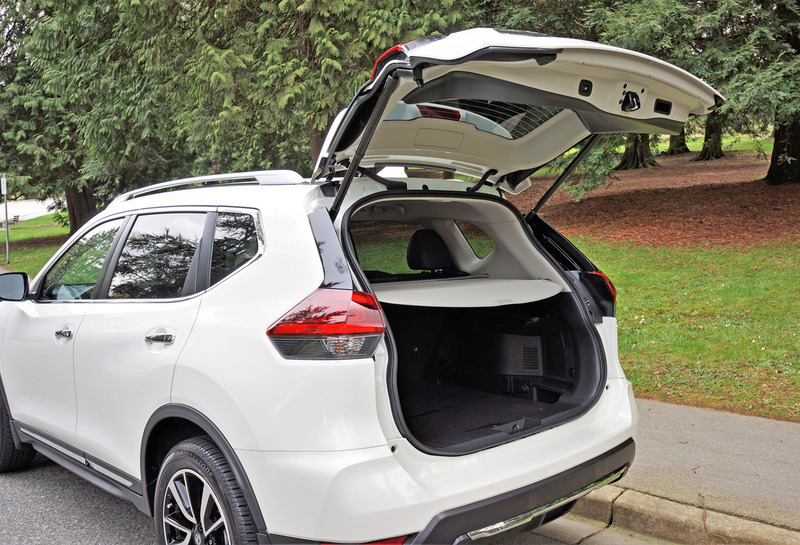 It’s a smart, innovative cargo system that really sets the Rogue apart. 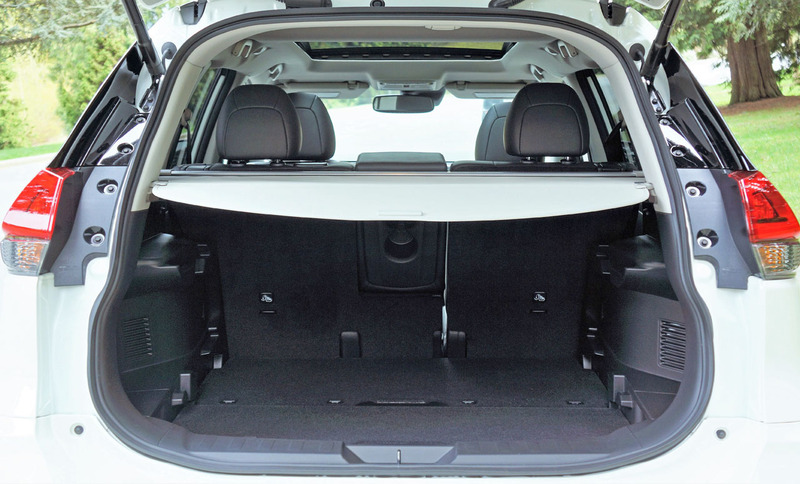 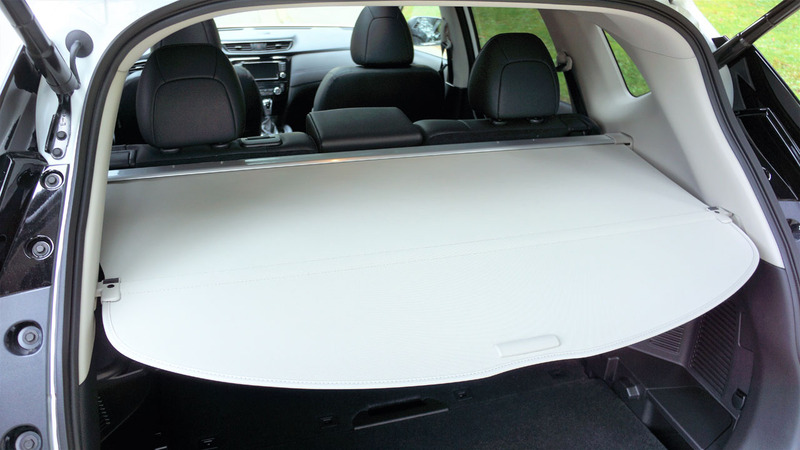 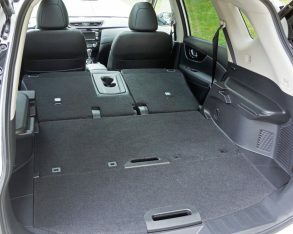 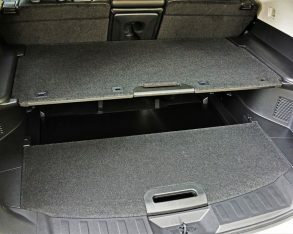 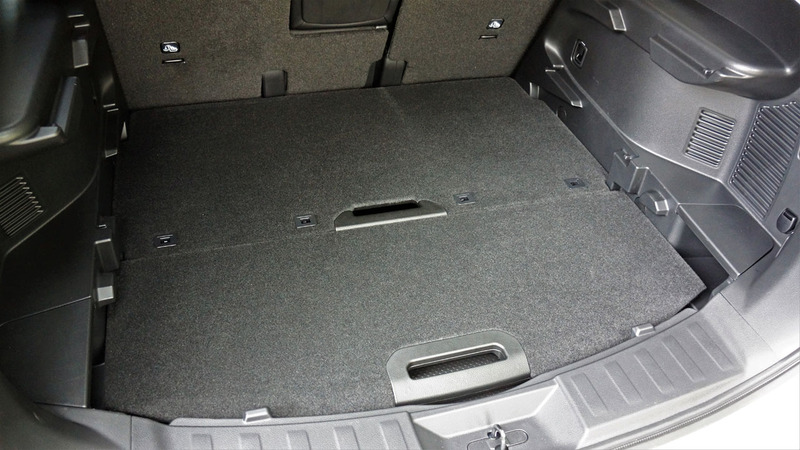 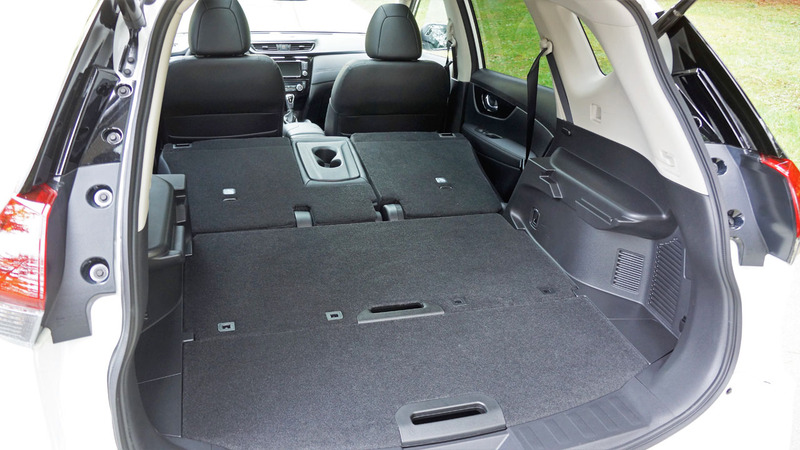 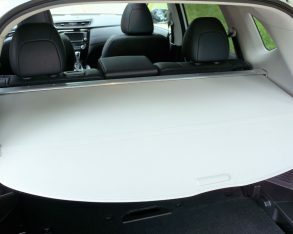 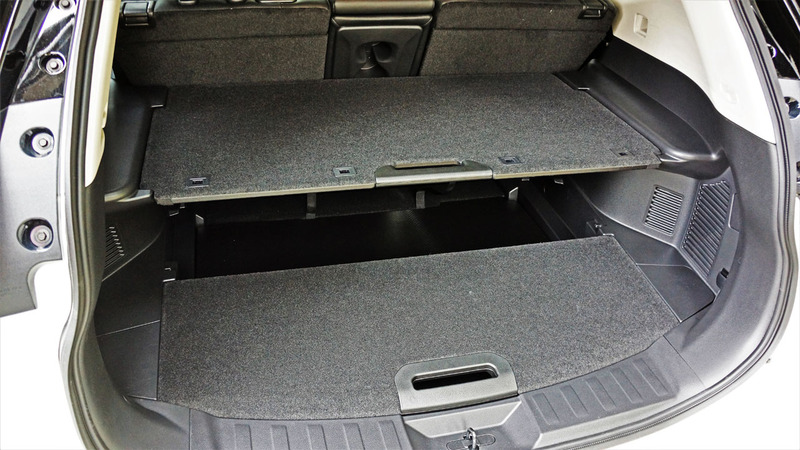 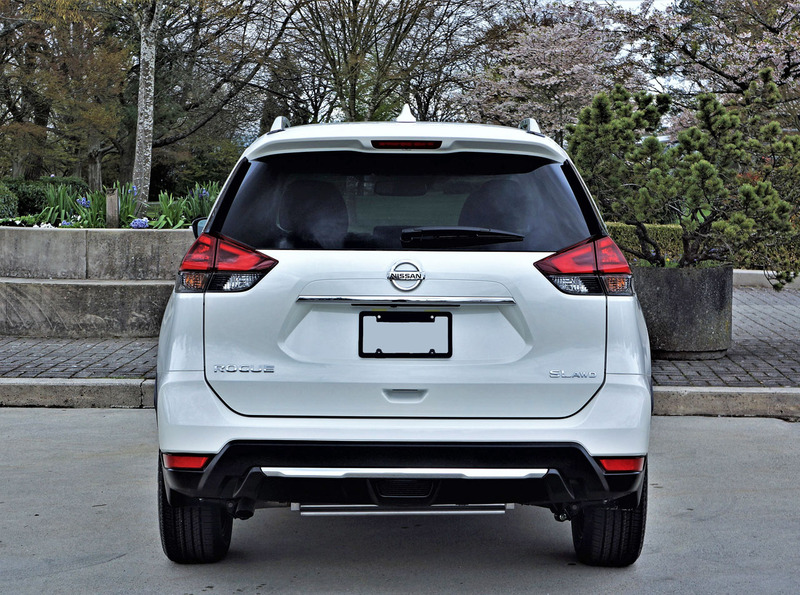 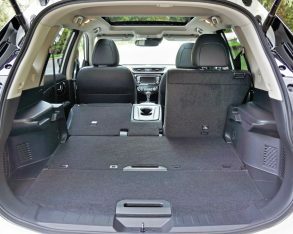 This said, when the need to lower the rear seats presents itself you’ll be forced to walk around to the side doors, as Nissan doesn’t provide levers on the cargo walls to do this automatically like some others in the compact SUV segment. 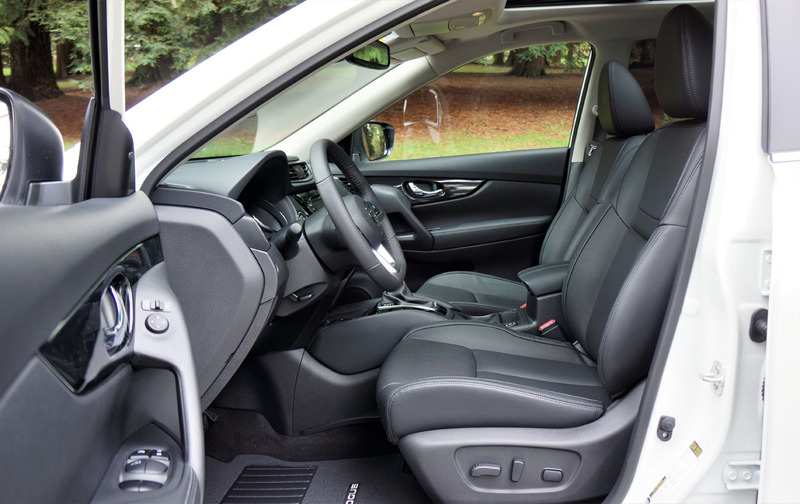 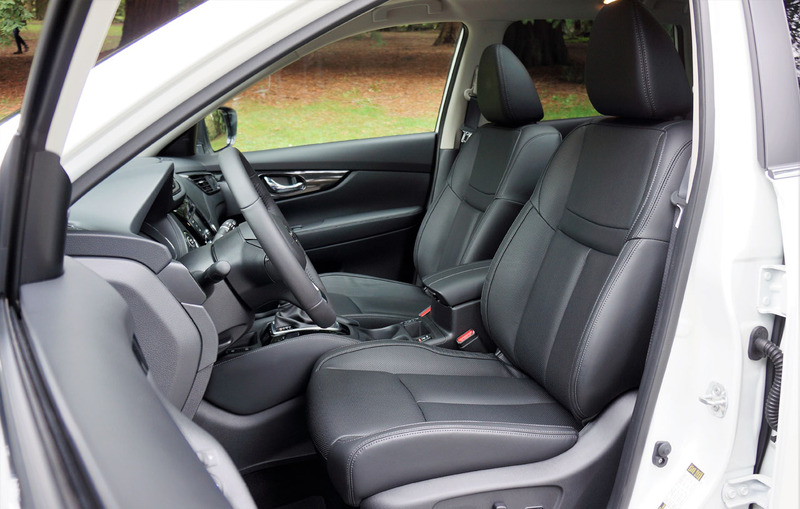 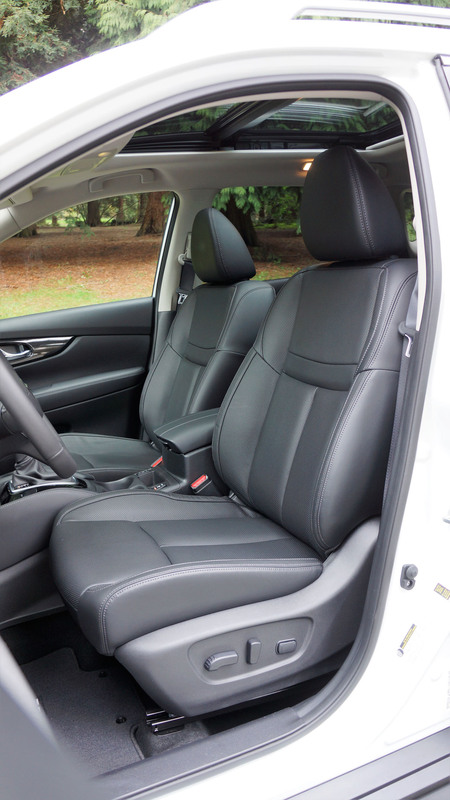 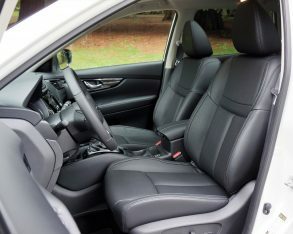 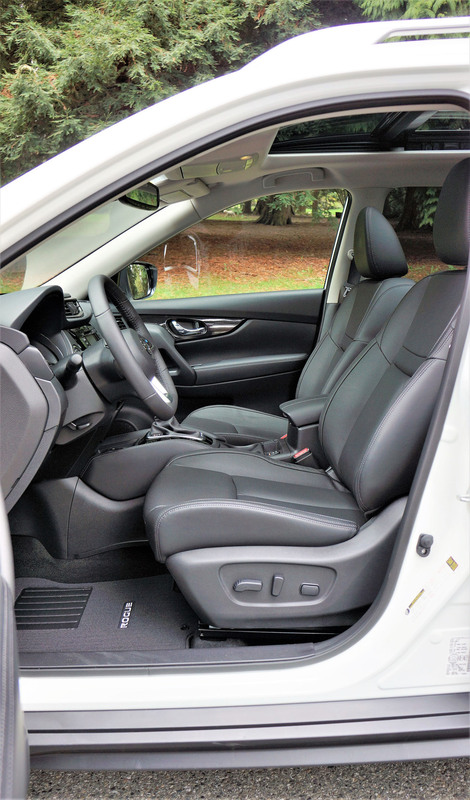 Back in the driver’s seat, the Rogue gets positive marks for its excellent ride quality, overall comfort and impressive quietness. 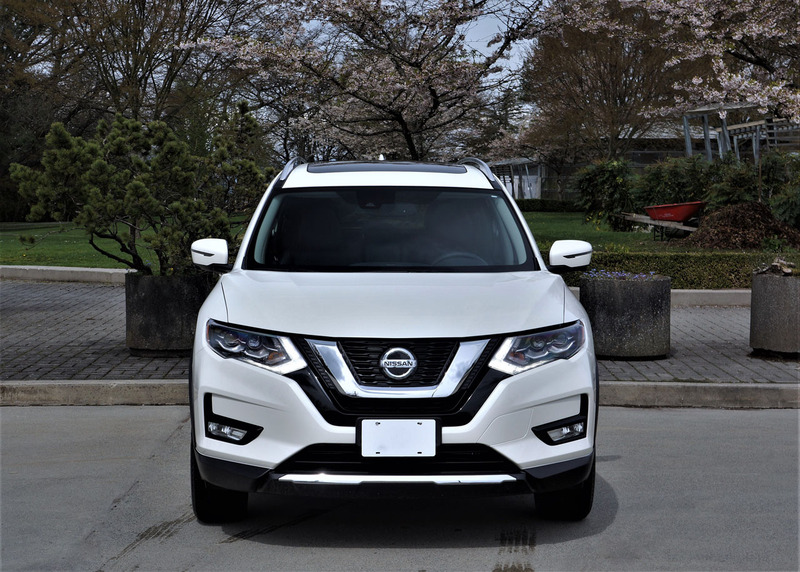 This is just another way it feels like a premium compact SUV, while its drivetrain is one of the smoothest operators in the category too. 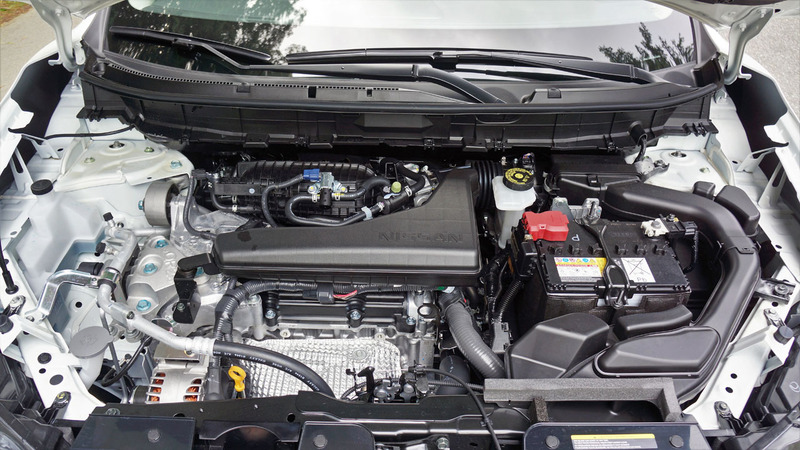 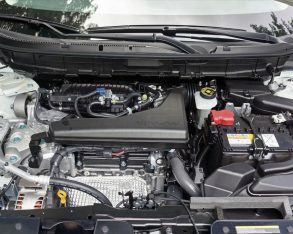 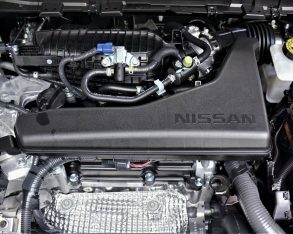 On that note, it’s probably not the ideal compact SUV for performance enthusiasts, as its sole 2.5-litre four-cylinder engine makes just 170 horsepower and 175 lb-ft of torque, while the continuously variable transmission (CVT) it comes mated to was primarily designed for smooth, silky operation over snap-to-it get-up-and-go. 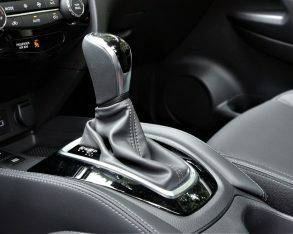 Nissan does include a manual mode via the shift lever, but I only used it for testing and wasn’t amused. 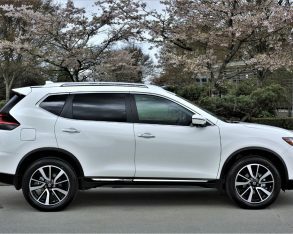 Just the same, the Rogue moves away smartly from stoplights, has no problem passing slower moving traffic on the highway and is a relative miser with fuel, its Transport Canada rating an estimated 9.7 L/100km in the city, 7.4 in the city and 8.7 combined with as-tested AWD, or an even thriftier 9.2 city, 7.0 highway and 8.2 combined with FWD models. 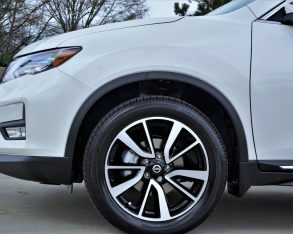 Similar to the Rogue’s straight-line performance, its comfortable suspension setup isn’t optimized towards sport, so it’s best just to sit back and enjoy the ride. 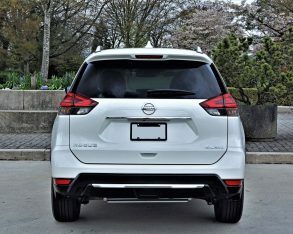 Don’t get me wrong as it can snake through a set of fast-paced corners quickly enough, holding on commendably, but it just doesn’t feel as secure doing so as some others in the compact SUV segment. 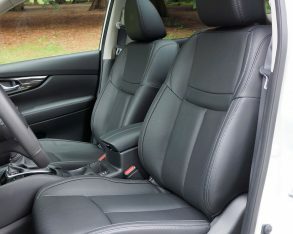 I don’t believe this will be much of an issue for most buyers, as all the big sellers in this class are similarly biased toward comfort. 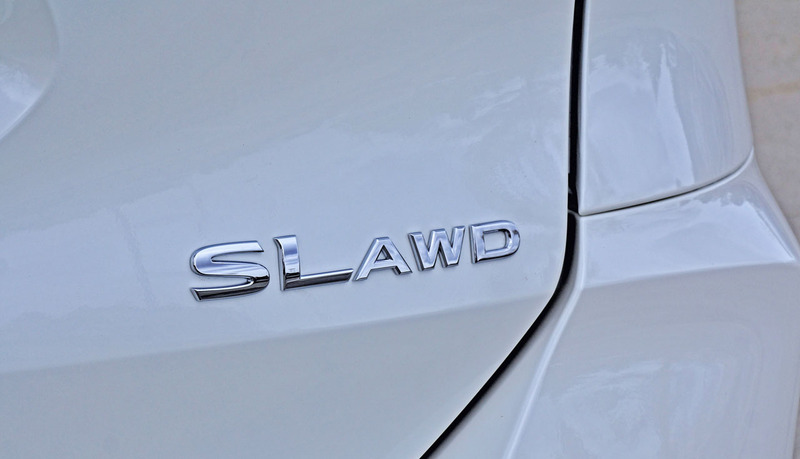 And to tell you the truth, that’s exactly how I like my family haulers. 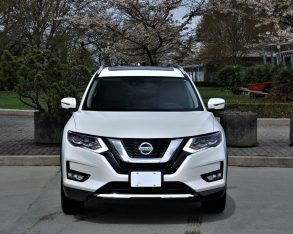 It’s a very rare moment that I get to put a vehicle through its paces when not searching out a suitable road or track for testing purposes, as life behind the wheel is more often than not experienced amid thick, congested traffic, or at best a cruise up the highway for a weekend getaway. 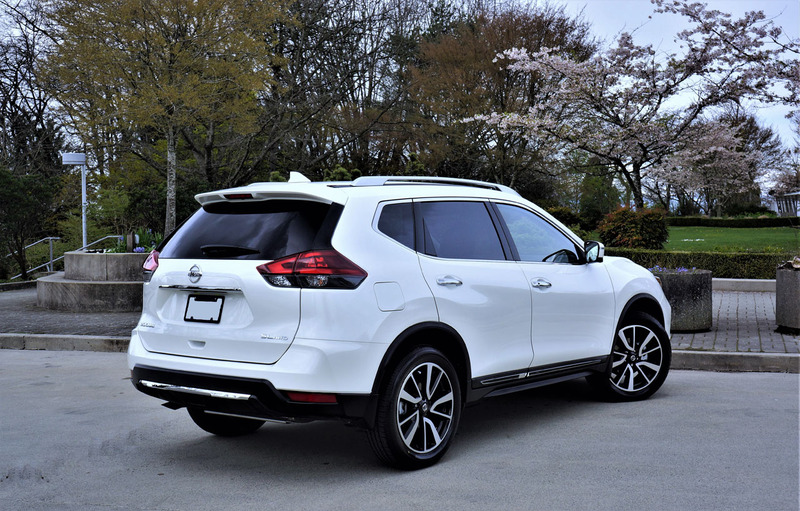 Therefore comfort takes priority over sport in this category, hence why the Nissan Rogue is finding so much success. 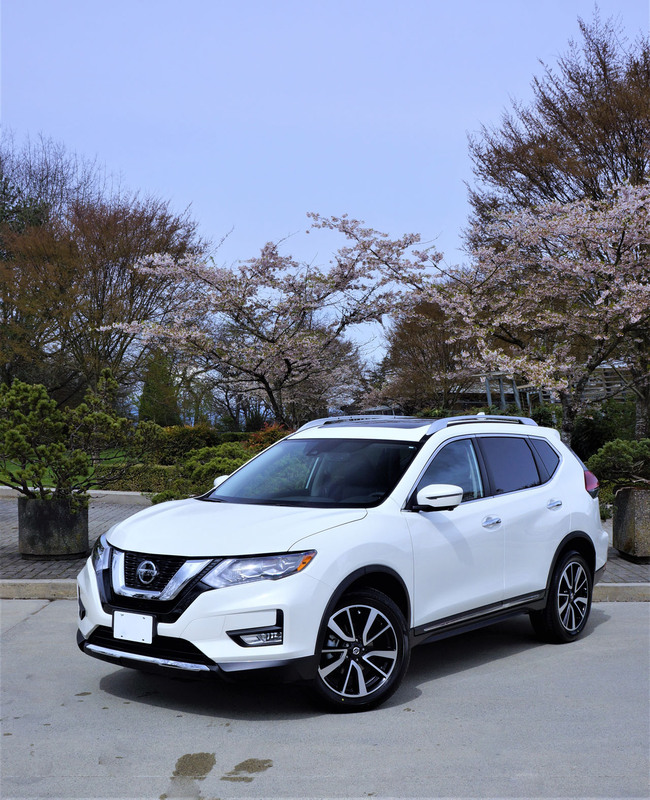 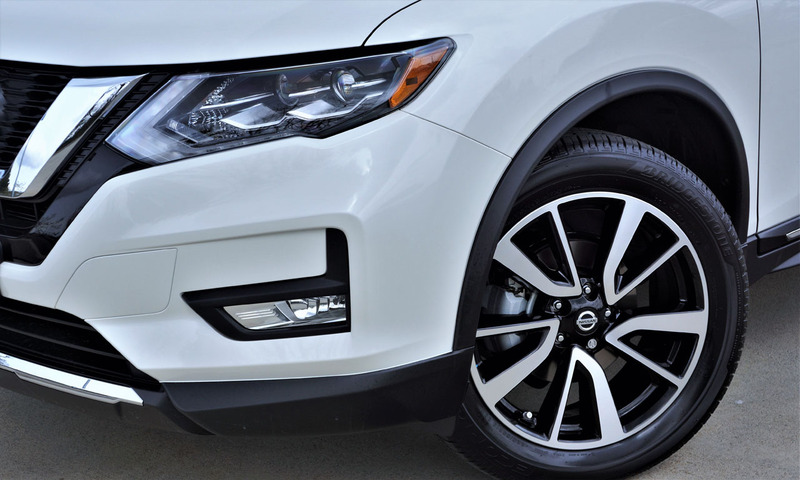 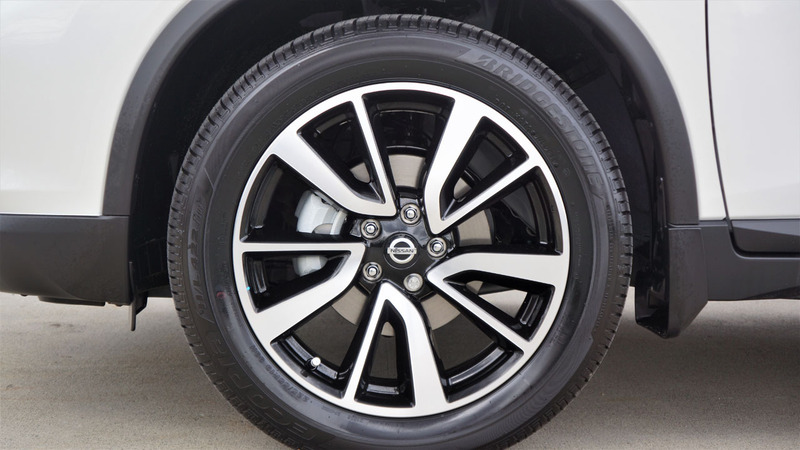 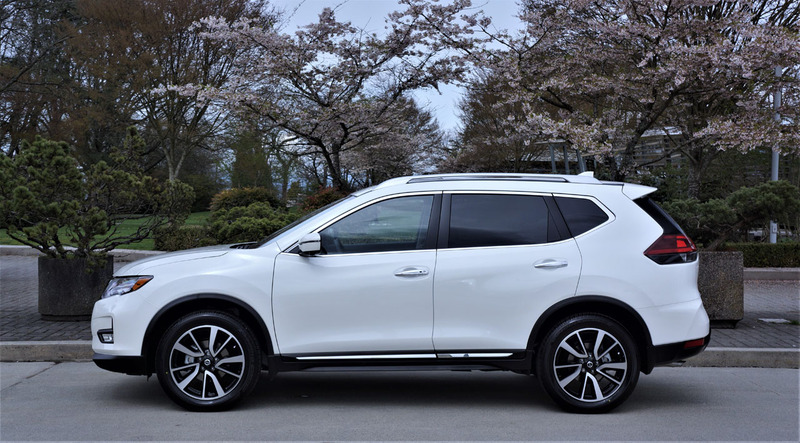 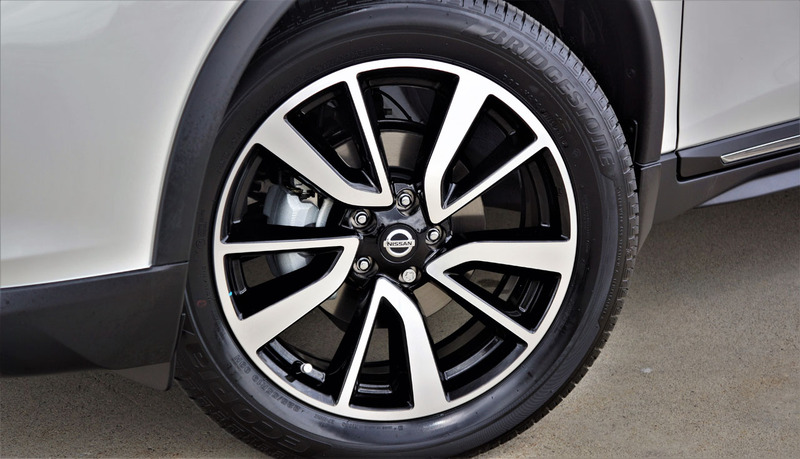 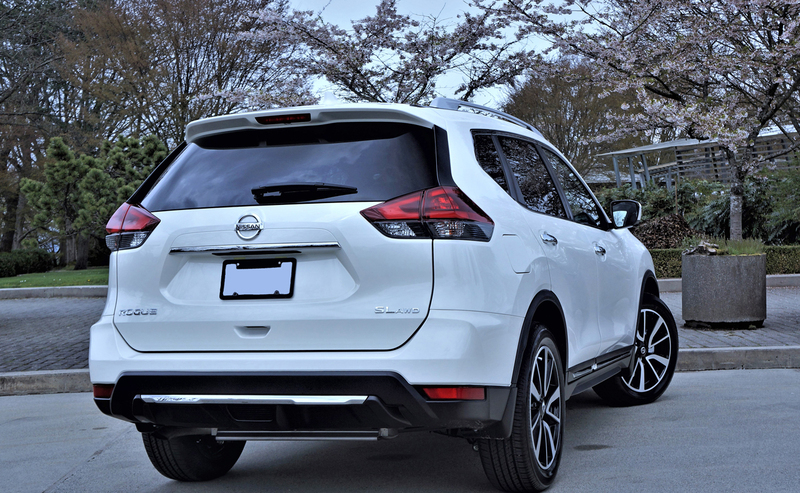 To that end the 2018 Nissan Rogue SL Platinum is a wonderful all-round people pleaser, providing performance that’s more than adequate, impressive economy, a comfortable, fully featured, spacious interior that’s big on luxury, and some pretty cool new tech. 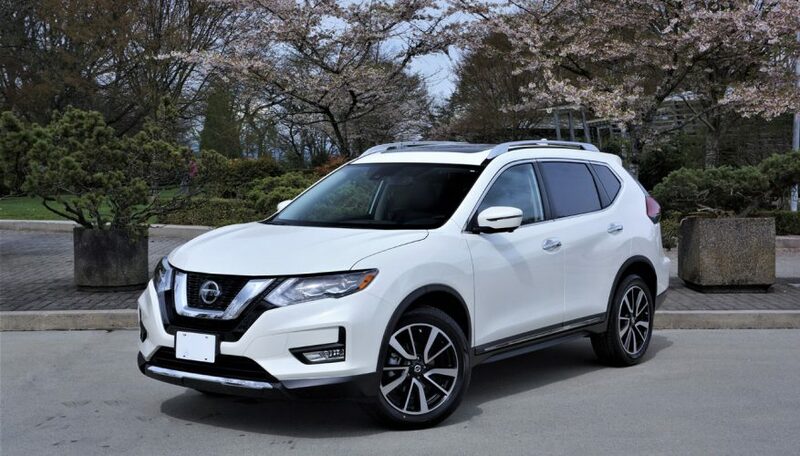 It should definitely be on your shortlist.